提出的新方案可以是系统或方法，它们可以以一种高效的方式利用和整合复数抗误码H.264编码/解码方案，来支持低延迟多媒体通讯应用的H.264兼容视频流的抗误码的编码。 The new solution proposed system or method may be, they may be in an integrated and efficient manner using a plurality of error resilience H.264 encoding / decoding scheme, low-latency support multimedia communications applications compatible H.264 video stream erroneous anti coding code. 即使在视频流的图像帧有网络损失时，这些抗误码H.264编码/解码方案仍能用来提供较高质量的视频。 Even when the image frame of the video stream have a network loss, these error resilience H.264 encoding / decoding scheme can still be used to provide higher quality video. 它有能力恢复这样的损失，并且较其他技术能够更快的恢复，而不需要为了获得同样级别的恢复通过所述网络发送的额外的数据/帧。 It has the ability to recover such a loss, and is able to recover faster than other techniques, in order to obtain the same level without the need for additional recovery of data transmitted over the network / frame. 近年来视频会议在企业中得到了迅速的发展，这是因为商业已经变得越来越全球化，并且雇员是与一个由远程员工、搭档、供应商和顾客组成的大型体系之间进行互动。  In recent years, video conferencing in the enterprise has been rapid development, because business has become increasingly global, and the employee is a large system and a remote employees, partners, suppliers and customers make up between interact. 同时，在消费者领域，能够获得便宜的软件解决方案和摄影机在手提电脑和移动设备中的广泛应用，都为采用视频聊天与家人和朋友之间保持联系起到了助推作用。 Meanwhile, in the consumer space, access to cheap software to solve a wide range of applications and cameras in laptops and mobile devices, are using video chat to maintain contact between family and friends and played a role in boosting. 然而，可用于视频会议的选项画面仍然是被分割为隔离状态，彼此间不能很好的相互联系。  However, the options screen can be used for video conferencing is still divided into isolated state, each other not well interconnected. 在企业内部也有基于硬件的会议室，装备了来自诸如宝利通、泰德和丽视等供应商提供的视频会议系统，以及被思科公司推广的高端网真系统。 There are also in-house hardware-based meeting room, equipped from sources such as Polycom, TANDBERG video conferencing system and LifeSize and other vendors, as well as the promotion of Cisco's high-end telepresence systems. 在价格范围的低端是基于企业视频会议应用程序的软件，如微软公司的Lync以及诸如Skype、GoogleTalk和苹果的FaceTime 等。 The low end of the price range is software-based enterprise video conferencing applications, such as Microsoft Lync and FaceTime such as Skype, GoogleTalk and Apple. 当选择使用任意上述视频电话系统时，在价格、质量和范围方面有很大的权衡。  When the selected video phone system using any of the above, there is a great tradeoff in terms of price, quality and scope. 为了实现低延迟、高清晰度的通话，大公司投资几十万美元在他们的网真系统上，但只能覆盖访问该类似的系统的一小部分人。 In order to achieve low-latency, high-definition calling, large companies invest hundreds of thousands of dollars on their telepresence systems, but only cover a small number of people accessing the similar system. 中小型企业投资数万美元在他们的能够实现高达720的高清晰度的分辨率的硬件系统上。 Small and medium enterprises to invest tens of thousands of dollars on their capable of up to 720 high-definition resolution of hardware systems. 他们购买价值几十万美元的带有固定数量端口的多方会议单元，并通过这些多方会议单元在他们不同的分公司之间进行通讯，但是，当要做到很容易与公司外部的系统进行交流时就很困惑。 They buy hundreds of thousands of dollars worth of multi-party conferencing unit with a fixed number of ports, and communications between their different branches through these multi-party conferencing unit, but when to do it is easy to communicate with external systems company very confusing time. 公司不能够承受这种使用例如Skype客户端的高投入低品质的解决体验，但是另一方面能够与其他人轻松地连接，无论这些人是在他们公司的内部或者外部。 The company is not able to withstand this example, high input and low-quality experience to solve the Skype client, but on the other hand can easily connect with others, inside or outside their company, whether these people are in. 当普通用户发现使用这些视频会议与使用那些不需要考虑这些顾虑而只是“可以工作”的手机或固定电话相比太复杂不能理解时，他们会有所顾虑。 When ordinary users find and use these video conferences that do not require the use of these concerns and to consider only "work" phone or landline too complicated compared to not understand, they have concerns. 因此，尽管视频会议的技术是可行的并且大多数人能承担的起价格，但在商业中采用视频会议的比例较低。 Therefore, even though video conferencing technology is feasible and most people can afford that price, but a lower proportion of the use of video conferencing in business. 今天，人们比从前更加需要一种消除这种顾虑并且提供一种几乎与声音通话一样价格的、不用用户考虑复杂的顾虑的高质量的视频通话。  Today, there is a greater need than ever for eliminating this concern and provide a sound almost identical to the price of a call, the user need not consider the complexity of the concerns of high quality video calls. 这样的服务将会连接来自于不同的供应商的不同的视频会议以及聊天系统的硬件和软件，在彼此间互相交谈时，该视频通话涉及到不同的协议(H. 323，SIP，XMPP ,proprietary)和具有不同的视频和音频编解码器。 This service will connect different from different hardware and software vendor video conferencing, and chat system, when talking to each other in each other, the video call involves a different protocol (H. 323, SIP, XMPP, proprietary ) having different video and audio codecs. 该视频通话将提供比现有的解决方案更低延时性和更好的视觉体验，它将要被托管在互联网或云端，因此公司不再需要花费大量资金和运营投资复杂的设备。 The video call would provide lower latency and better visual experience than existing solutions, it will be hosted on the Internet or the cloud, companies no longer need to spend a lot of money to invest and operate complex equipment. 易用性将和安装音频电话会议一样简单，不需要来自公司IT复杂的准备安排。 The ease of use and installation of audio teleconferencing is as simple, does not require complex preparation from the company IT arrangements. 现有技术中的上述例子和它们的限制是用来示例说明的，不是专用的。  Examples of the above-described prior art and are used to their limit of illustration, not private. 在阅读了说明书及附图之后，将会很清楚现有技术中的其他限制。 After reading the description and the accompanying drawings, it will be apparent other limitations of the prior art. 图1描述一个跨越多重标准和专有的视频会议系统支持虚拟会议室（Virtual Meeting Room，简称VMR)运行的系统的例子。  Figure 1 depicts a multi-standard and proprietary video conferencing system across support virtual conference room (Virtual Meeting Room, referred VMR) example of a system operation. 图2描述一个跨越多重标准和专有的视频会议系统的虚拟会议室操作过程流程图的例子。  Figure 2 depicts a multi-standard and proprietary video conference system across the conference room during an operation flowchart of the virtual example. 图3描述一个媒体处理节点的各种组件的例子。  Figure 3 depicts various components of an example of a media processing node. 图4A-图4B描述在一个简单的并向量场景下媒体编码的实施例图表。  FIGS. 4A- 4B depicts an embodiment chart media encoding the vector and a simple scenario. 图5描述一个可高度扩展的音频混合和抽样的图表的例子。  FIG. 5 depicts a highly scalable audio mixing and sampling graph example. 图6描述一个基于互联网/云技术的音频声波回声消除器的例子。  FIG 6 depicts an example of a canceller acoustic echo Internet-based audio / cloud technology. 图7A-7C描述一个在本地局域网的每个邮局协议之间或者横跨广域网的多个邮局协议(POPs)之间的多相位媒体流分配过程的例子。 Examples  Figures 7A-7C describe a Post Office Protocol between each local area network or wide area networks across a plurality of Post Office Protocol (POPs) between the multi-phase media stream distribution process. 图8描述一个支持虚拟会议室(VMR)的全球基础设施引擎的软件组件的例子。  Figure 8 depicts a support virtual conference room (VMR) engine of global infrastructure software components examples. 图9描述一个用于容错协议的高级机制的实施例，其中该容错协议用于阻止错误输入以避免造成不稳定或安全漏洞。  Figure 9 depicts a high-level mechanism for fault-tolerant protocol embodiment wherein the fault tolerant protocol for preventing erroneous input in order to avoid instability or security vulnerabilities. 图10描述一个图解防火墙穿越技术的例子。  Figure 10 depicts a graphical example of firewall traversal technique. 图11描述一个图解管理和控制视频会议的例子。  Figure 11 depicts a diagram of a video conference management and control examples. 图12描述一个图解使用全球基础设施引擎的多方会议单元(MCU)进行高质量事件共享的例子。  FIG. 12 illustrates a graphic engine using a global infrastructure of multi-party conferencing unit (MCU) shared examples of high-quality event. 图13描述一种将一台笔记本电脑或移动电话与一个会议室系统相关联的方法的例子。 A description example of  FIG 13 a method for a mobile phone or laptop computer with a system associated with the conference room. 图14描述一个图解对参与者提供欢迎屏幕内容的例子。  FIG. 14 illustrates a description example of the welcome screen provides the content of the participants. 图15描述一个在每次通话基础上个性化视频会议室的图解的例子。  Figure 15 depicts a diagrammatic personalized video conference room on the basis of each call in the example. 图16描述一个用于个性化共享某人的桌面、笔记本电脑和/或移动电话屏幕的单一的在线“主页”的例子。  Figure 16 depicts a share for someone personalized desktop, laptop examples and / or mobile phone screen single-line "home page" of. 图17描述一个通过邮箱单击视频会议进行登入的实例。  Figure 17 depicts a sign for instance by clicking mailbox videoconference. 图18描述一个图解向参与者传送一个虚拟现实体验的例子。  FIG. 18 depicts a participant is transmitted to a virtual reality experience in the illustrated example. 图19描述一个图解向参与者提供增强真实用户交互服务的例子。  FIG. 19 illustrates a description example of providing enhanced user interactive service transactions to the participant. 图20A-20C示出了具有相关时间层和图像号码的H. 264视频流的编码方案的例子。  Figures 20A-20C illustrate an example H. 264 coding scheme associated with the time of the video stream layer and the image number. 本发明的方法通过示例的方式进行描述而不只是限于附图，在附图中相同的标号对应相同的元件。 Method  The present invention is not just limited to the drawings will be described by way of example, the same elements in the same corresponding reference numerals. 值得注意的是，“一个”或“一”或“一些”的用法在本公开的实施例中不一定指代相同的实施例，这样引用意味着至少一个。 It is noted that, "a" or "an" or "some" embodiment in the usage of the present disclosure do not necessarily refer to the same embodiment, such references mean at least one. 本发明提供一种新方法，所述新方法具有成熟的系统和方法以支持一个虚拟媒体室或虚拟会议室(Virtual Meeting Room，VMR)的操作，其中每个(VMR)可以接受来自不同的地理位置的多个参与者，接受来自视频会议终端和其他多媒体功能设备的音频、视频、演示和其他媒体流的多个视频会议源，所述其他多媒体功能设备也可以是专有的或基于标准的并且在多数参与者之间能够进行多方通讯或点对点视频会议。  The present invention provides a new method, a new method has sophisticated systems and methods to support a virtual meeting room or virtual media chamber (Virtual Meeting Room, VMR) operation, wherein each of (the VMR) acceptable from a plurality of participants in different geographic locations, receiving audio from the video conference terminals and other multimedia devices, the plurality of sources of video conference video, media presentations and other stream, other multimedia functions of the devices may be proprietary or standards-based and capable of multi-point video conferencing or communication between the majority of participants. 对于一个非限制性的例子，来自视频会议终端的视频源包括但不限于Skype，同时来自基于标准视频会议终端的视频源包括但不限于H.323和SIP。 For a non-limiting example, the video source from the video conference terminals include but are not limited to Skype, while from the video conferencing terminals based on standards including but not limited to video source H.323 and SIP. 每个单一的VMR可以通过一个分散为一系列商品服务器的全球基础设施支持，所述商品服务器作为媒体处理节点共同位于互联网接入的接入点(Points of Presence，POSs)，其中这种大规模地分布式体系结构能够以一种不需要预约的方式同时支持成千上万的活动的VMRs并且其对于VMRs的用户也是透明的。 Every single VMR may be dispersed by a global infrastructure to support a range of commodity servers, commodity servers as the media processing node are co-located access to the Internet access point (Points of Presence, POSs), where such a large scale the distributed architecture that does not require a reservation can simultaneously support thousands VMRs activities and which is also transparent to the user of VMRs. 每个VMRs提供给它的用户一套迄今为止视频会议的参与者从未体验过的丰富的会议和协作互动。 Each VMRs available to its users a video conference participants so far never experienced veteran of the conferencing and collaboration interaction. 所述的这些互动包括对视频会议会话的控制、配置、会议参与者的可视化布局、VMR的定制和以及为适应不同的参与者对会议室的改编。 These interactions include controlling the video conference session, configuration, visual layout of the conference participants, as well as the VMR and customized to accommodate adaptation of the different participants in the conference room. 对于一个非限制性例子，这样的VMR是用于在两个不同的终端如Skype客户端和一个基于标准H. 323端之间的点对点通话，其中所述Skype用户在不知道其它用户的终端技术的情况下对另一个发起呼叫，在确定两个终端之间转换的必要性之后自动在双方之间建立一个VMR。 For a non-limiting example, such VMR is used in two different terminals such as Skype and a client-based end-point between the standard H. 323 call, Skype wherein said user terminal of the user does not know the other technology another case where a call, establishing a VMR after determining the necessity of the automatic conversion between the two terminals between the two parties. 所述方法进一步利用虚拟现实和增强现实技术，以各种客制化的方式去转化来自参与者的视频和音频流，以实现一系列丰富的用户体验。  The method further using virtual reality and augmented reality technology to a variety of customized way to convert video and audio streams from the participants in order to achieve a rich user experience. 所述全球分布式基础设施通过多点控制单元支持在地理分散位置的参与者之间事件的共享，所述多点控制单元用于实时处理来自多个视频会议终端的多个音频和视频流。 The globally distributed infrastructure through a multi-point control unit supports shared among the participants in the event geographically dispersed locations of the multi-point control unit for multiple real-time processing of audio from multiple video conferencing terminals and video streaming. 与传统的要求每一个视频会议的参与者遵守同样地通讯标准或协议的视频会议系统相比，本发明的VMR允许视频会议的用户或参与者使用独立样式的设备和协议参与多方或点对点视频会议会话。  compared to the same manner as in compliance with communication standards or protocols for each participant video conference system and a video conference conventional requirements, VMR the present invention allow a user or video conference participants to use the device and protocol independent form or participating in the multipoint point video conferencing session. 通过在没有终端用户介入的互联网或云中对视频和音频流执行透明操作，所述方法将不同设备和不同协议的视频会议系统和现今世界上存在的各种视频聊天结合在一起使之作为一个整体的系统。 Through the video and audio streams perform transparent operations, the method and apparatus of different video conference system and a variety of different protocols exist today video chat binding world without end user intervention Internet cloud or together as a so the overall system. 将VMR托管在互联网或云中使得参与者能够透明地向任何人发起呼叫，并且在所有注册终端设备中通过VMR给他们打电话，以及允许被呼叫者以他们希望的任意终端设备来接听该电话。  The VMR hosted on the Internet or the cloud such that participants to initiate a call transparent to anyone, and call them by the VMR all registered terminal apparatus, and the caller is allowed to be an arbitrary terminal device they wish to to take the call. 一个托管在互联网或云中的VMR能使任意参与者上传媒体内容到云中，并且以他们选择的格式转播给其他参与者，可以修改或者不修改。 A hosted in the Internet cloud VMR or any participant can upload media content to the cloud, and broadcast format of their choice to the other participants, can not be amended or modified. 图1描述一个跨越多重标准和专有的视频会议系统支持虚拟会议室(VMR)操作系统100的例子。  Figure 1 depicts a multi-standard and proprietary video conferencing system across support virtual conference room (the VMR) Examples 100 operating system. 尽管图中描述的组件功能独立，这样描述只是为了便于说明。 Although separate functional components depicted in the figures, such description is for convenience of explanation. 显而易见地，图中对组件的描述可以任意的合并或分成单独的软件、固件和/或硬件。 Obviously, the description of FIG component can be arbitrarily combined or divided into separate software, firmware and / or hardware. 此外，明显地，对于这样的组件无论是怎么样的合并或分离都能在同一个或多个主机上执行，或在一个或多个主机上的几个虚拟化的实例，其中所述一个或多个主机可以与分布在世界各地的一个或更多个网络连接。 In addition, obviously, no matter how the kind of separation can be combined on the same or one or more hosts for the execution of such components, or several instances of virtualized on one or more hosts, wherein said one or multiple hosts can be connected in a distributed all over the world or more networks. 如图1所示，所述系统100包括至少一个操作所述VMRs的VMR引擎102、一个支持所述VMRs操作的全球基础设施引擎104和一个用于加强VMRs用户体验的用户体验引擎106。  1, the system 100 includes at least one operation in the VMR VMRs engine 102, a support operation of the global infrastructure VMRs engine 104 engine 106 and user experience for the user experience reinforcing VMRs . 此处所用的引擎是指用于完成一个目的的软件、固件、硬件或其他组件。  As used herein, refers to complete engine is a purpose software, firmware, hardware or other components. 所述引擎主要包括存储在非易失性存储器(也指辅助存储器）中的软件指令。 The engine includes software instructions stored in non-volatile memory (also referred to secondary memory). 当执行软件指令时，至少一个子集的软件指令被处理器输入到内存(也指主存储器）中。 When executing software instructions, software instructions at least a subset of the processor to the memory is input (also referred to main memory). 所述处理器在内存中执行所述软件指令。 The processor executes the software instructions in the memory. 所述处理器可能是一个共享处理器、一个专用处理器，或共享和专用相结合的处理器。 The shared processor may be a processor, a processor, dedicated processor, or a combination of dedicated and shared. 一个典型的程序包括对硬件组件(如输入/输出设备)的调用，所述的硬件组件通常需要驱动程序的执行。 A typical procedure includes a call to a hardware component (e.g., input / output devices), typically the hardware components necessary to drive the execution of the program. 所述驱动程序可能会或可能不会被认为是引擎的一部分，但区别不是主要的。 The driver may or may not be considered part of the engine, but the difference is not essential. 如图1所示，所述每个引擎在一个或更多个托管装置(主机）中运行。  As shown in FIG 1, the engine runs in each of the one or more managed devices (hosts) in. 其中，所述一个主机可以是一个计算机装置、一个通讯装置、一个存储装置或具有运行软件组件能力的任意电子装置。 Wherein a host may be a computer device, a communication device, any electronic device or a memory device having the ability to run software component. 对于一个非限制性的例子，一个计算机装置可以是但不限于一台笔记本电脑、一个台式电脑、一个平板电脑、一个苹果平板电脑、一个苹果多媒体播放器、一个苹果手机、一个苹果MP4播放器、谷歌的安卓设备、掌上电脑，或者一个服务器机器，所述服务器是一个物理的或者虚拟的服务器，并托管于服务供应商或服务供应商的第三方提供的在互联网公共或者私人数据中心，或者位于企业的私有信息中心或者办公场内。 For a non-limiting example, a computer device may be, but is not limited to a laptop computer, a desktop computer, a tablet computer, a tablet, apple, apple a multimedia player, an iPhone, an Apple MP4 player, Google's Android devices, handheld computers, or a server machine, the server is a physical or virtual server, and hosted service providers or third-party service providers in the public Internet or a private data center, or in private enterprise information center or office floor. 存储装置可以是但不限于一个硬盘驱动器、一张闪存驱动或任意手提式存储装置。 Storage means may be but is not limited to a hard disk drive, a flash drive or any portable storage device. 通讯装置可以是但不限于移动电话。 The communication device may be, but is not limited to a mobile phone. 如图1所示，所述每个VMR引擎102、全球基础设施引擎104和用户体验引擎106有一个或多个通讯接口（未示出），这些通讯接口是软件组件能够使所述引擎通过一个或更多的通讯网络根据确定的如TCP/IP通信协议进行相互通讯。  1, the engine 102 each VMR, global infrastructure and user experience engine 104 engine 106 with one or more communication interfaces (not shown), a communication interface which enables the software component the engine communicate with each other in accordance with TCP / IP communications protocol determined by one or more communications networks. 其中，所述通信网络可以是但不限于互联网、内联网、广域网、局域网、无线网络、蓝牙、无线局域网和移动通讯网络。 Wherein, the communication network may be, but is not limited to the Internet, intranet, WAN, LAN, Wi-Fi, Bluetooth, wireless LAN and mobile communication networks. 所述网络的物理连接和通讯协议是本领域的技术人员所熟知的。 The physical network connections and protocols are those of skill in the art. 图2描述一个跨越多重标准和专有的视频会议系统的虚拟会议室操作过程流程图的例子。  Figure 2 depicts a multi-standard and proprietary video conference system across the conference room during an operation flowchart of the virtual example. 为了说明起见，虽然该图以特定的顺序描绘了功能步骤，但本发明的过程不限于任何特定或安排的步骤。 For purposes of illustration, although this figure depicts functional steps in a particular order, but the process of the present invention is not limited to any particular steps or arrangement. 熟悉本领域的技术人员应该知道该图中描述的不同的步骤可以以各种方式省略、重排、合并和/或改编。 Those skilled in the art will appreciate that the various steps described in FIG various ways may be omitted, rearranged, combined and / or adapted. 如图2所示，所述流程图200开始于方框202，其从多个参与者接受来自多个视频会议终端的多个视频会议源，其中所述每个视频会议终端与所述虚拟会议室的多个参与者中的某个参与者相关联。  As shown in FIG. 2, the flowchart 200 begins at block 202, which receives a plurality of sources from a plurality of video conferencing terminals from a plurality of video conference participants, wherein each of the video conference terminal and the said multiple participants in the virtual meeting room associated with a participant. 所述流程图200中接下来是方框204,描述的是对于VMR的每个参与者，将所述多个视频会议源转换并混合入与参与者关联的视频会议终端相兼容的复合视频和音频流。 Next, the flowchart 200 is a block 204, for each participant is described with the VMR, the plurality video conference source converter and mixed into the video conference participant associated with the compatible composite video terminal and audio stream. 所述流程图200中接下来是方框206,描述的是启动一个能够在多个参与者之间被实时启动的多方视频会议会话，其中所述多个视频会议终端的类型不同。 Next, the flowchart 200 is a block 206, a start is described which can be activated in real time between a plurality of participants in a multiparty video conference session, wherein the different types of the plurality of video conferencing terminals. 所述流程图200 结束于方框208,所述方框208描述的是将复合音频和视频流呈现给每个VMR的参与者以增强用户体验。 The flowchart 200 ends at block 208, the block 208 is described in the present composite audio and video streams to each participant the VMR to enhance the user experience. 为转化视频会议源，本发明涉及的技术包括但不限于代码转换、升频、降频、转换、 混合、添加和移除视频、音频和其它多媒体流、降噪和视频会议源的自动增益控制(AGC)。  as a conversion source video conferencing, the present invention relates to techniques include, but are not limited to the code conversion, frequency, frequency down conversion, mixing, add and remove video, audio and other multimedia streaming, video conferencing, and noise sources automatic gain control (AGC). 在一些实施例中，所述VMR引擎102在两个不同的终端如Skype客户端和一个基于标准H.323端之间建立点对点通话，其中所述Skype用户在不知道其它用户的终端技术的情况下对另一个用户发起呼叫，在确定两个终端之间所需的转换的必要性之后，自动在两方之间提供一个虚拟会议室。  In some embodiments, the two different engine VMR terminals such as Skype client and establish a peer-based conversation between standard H.323 terminal, wherein the user does not know the Skype other user terminals 102 initiate a call to another user in the case of technology, the need for after conversion required between two terminals is determined, automatically providing a virtual meeting room between two parties. 在这种情况下，所述VMR用于允许两个终端之间进行通讯，而不用用户去知道或担心终端所使用的协议、视频编码、音频编码或其他技术之间的不同。 In this case, the VMR to allow communication between two terminals, without the user to know or worry about the difference between the protocols used by the terminal, a video encoder, audio encoding, or other techniques. 在一些实施例中，所述VMR引擎102混合和渲染所述复合视频和音频流以紧密匹配所述多个参与者关联的视频会议终端的性能，以使参与者得到更高效的会议体验。  In some embodiments, the VMR hybrid rendering engine 102 and the composite video and audio streams to closely match the performance of the plurality of associated video conference participant terminals, to make more efficient conference participants to obtain experience. 当合成最终呈现的视频和音频流帧时，所述VMR引擎102可以考虑参与者的创新视频布局以及视频会议中各种参与者的活跃性。 When the video and audio stream rendered synthesis of the final frame, the VMR engine 102 can be considered innovative activity participant video conference, and video layout of the various participants. 对于一个非限制性例子，所述VMR可以给活跃的讲话者相对于其他参与者突出的显示。 For a non-limiting example, the speaker can give VMR active relative to other participants in the highlighted display. 在一些实施例中，VMR引擎102还可以将伴随着视频会议源的多媒体数据流/内容调解为复合音频/视频流的一部分以协作处理，其中，所述多媒体数据流将要包括但不限于，幻灯片共享、电子白板、媒体流和台式机显示屏。 In some embodiments, the VMR engine 102 may also be associated with the multimedia data stream video conference source / content mediation composite audio / portion of the video stream to collaborate, wherein the multimedia data stream to be included but are not limited to, slide sheet shared whiteboard, and desktop streaming media display. 也支持用于参与者之间实时通讯的聊天风格信息。 Also supports chat style information for real-time communication between participants. 参与者的状态信息包括但不限于所使用终端的类型，接收到的信号质量以及可以对所有的参与者显示的音频/视频的柔和状态。 Participants state information includes, but is not limited to the soft state type of terminal used, the received signal quality, and can display all of the participants in an audio / video. •低分辨率压缩缩略视频。  • low resolution compressed video thumbnail. 如图3所示，媒体处理节点300中的视频合成器302选择其需要的哪个视频流是基于需要组成和呈现给参与者的视频来选择的。  3, the media processing node 300 in the video combiner 302 to select which video stream need thereof the composition is based on the need and presented to the participants to the selected video. 上述列出的两个或多个压缩形式的视频流被视频代码转换器304转换并使用互联网上的多路地址通过分布式多路视频开关306发送，以至于其它远程的想要这些视频流的媒体处理结点可以根据需要去订阅他们。 Two or more of the above-listed video stream is a compressed form of the video transcoder 304 and converted using the multiplexed address on the Internet to send multiple video distributed by the switch 306, so that other remote video streams is desired media processing node can subscribe to them as needed. 该方案允许整个集群中的结点（本地和全球）以最有效的方式共享和/或交换音频和视频流。 This scheme allows the node (local and global) across the cluster in the most efficient way to share and / or exchange of audio and video streams. 所述数据流可以通过公共网络、专用网络或通过一个有服务级别保证的预分配的覆盖网络传输。 The data flow through a public network, a private network or through a network covering a pre-assigned transmission guaranteed level of service. 使用这种方法，视频合成器302可以显示各种合成结果，所述合成结果包括但不仅限于只是活动的讲话者、两个并排显示的正在会话的人以及参与者要求的任何其他自定义格式，其可能包括将所述视频转换为其他表现形式。 Using this method, a video combiner 302 may display various synthesis result, the synthesized result including but not limited only active speaker, two people are displayed side by side session participants requested and any other custom formats, which may include converting the video into other forms. #帧速率。  # the frame rate. 所述的这些特征被用于建立一个与未压缩的视频流以及压缩的合成流或其他变换数据相关的元数据字段。  These features are described for establishing a stream of uncompressed video and the compression of the composite stream, or other data related to the converted metadata fields. 在一些实施例中，视频合成器302不仅将原始视频流组合成一个复合视频流，而且还建立了一个复合的元数据字段，以将概括于所述元数据字段的同样的操作(包括2D和3D 的操作)应用至所述复合视频的个别视频流。  In some embodiments, the video synthesizer 302 into the original video stream combination only a composite video stream, but also the establishment of a composite metadata fields, the same operation will be summarized in the metadata fields ( including an operating 2D and 3D) applied to the individual composite video stream. 对于一个非限制性的例子，运动矢量需要采用相同的变换，这样视频合成器302可以适用于每个原始的视频流，所述的运动矢量包括但并不限于，缩放，旋转，平移，剪切操作。 For a non-limiting example, the motion vector needs to use the same conversion, and video combiner 302 may be applied to each of the original video stream, the motion vector, including but not limited to, scaling, rotation, translation, shearing operating. 所述元数据可以被应用于其他非实时性的多媒体服务，其中所述多媒体服务包括但不限于用于离线搜索和索引的记录的数据流和注释的数据流。 The metadata may be applied to other non-real-time multimedia services, wherein the multimedia service including but not limited to data streams and comments recorded offline search and indexing. •在H. 264的情况下，处理考虑了宏块被细分为4 X 4的子块的情况。  • in the case of H. 264, the processing of the macroblock is considered sub-divided into blocks of 4 X 4 case. •在H. 263的情况下，宏块不能被细分或根据所使用的附件仅仅被细分为8 X 8的块。  • in the case of H. 263, a macroblock attachment can not be used only in accordance with the segment or block is subdivided into 8 X 8 in. •在H. 261的情况下，所述宏块不被细分。  • in the case of H. 261, the macro block is not subdivided. •跳过宏块检测：如果合成元数据指向一个静止兆字节MB，可以通过选择自动跳过来快速的跳过宏块检测。  • skipped macroblock detector: Synthesis of metadata if a stationary point megabyte MB, can automatically skip quickly skipped macroblocks detected by selection. #MV搜索范围：MV的搜索范围可以根据合成元数据信息动态调整，所述搜索范围可以根据元数据字段中与MV相匹配的兆字节直接估定。  #MV Search: MV search range may be dynamically adjusted based on the synthesis of metadata information, the search range can be directly assessed according to the metadata fields and MV match megabytes. #MV预测:在所述合成元数据中显示的MV是用于在运动估计期间的初级预测。  #MV Prediction: MV displayed in the metadata is synthesized during the initial prediction for the motion estimation. •量化:编码过程中使用的量化值是由合成元数据字段提供的数值约束。  • quantization: quantization values ​​used in encoding process is supplied by the numerical, constrained synthetic metadata fields. •帧速适配：当给出的帧速没有更新时，具有较低的帧速合成的区域则被标记并跳过。  • adaptation frame rate: frame rate is given when there is no update, a region having a lower frame rate and skip marks were synthesized. •没有运动的合成区域得到较少的比特位。  • no synthetic motion region obtained fewer bits. •每个视频的边界区域用较少的比特位编码。  • border region of each video encoded with fewer bits. 在音频的情况下，音频代码转换器/预处理器308将通过分布式多路音频混频器310在媒体处理节点300接收的每个参与者的音频流与其它参与者所接收的音频流混合在一起。  In the case of audio, the audio transcoder / preprocessor 308 310 other participants in the audio stream with media processing node 300 receives each participant received by the distributed multi-channel audio mixer audio streams are mixed together. 所述混合输出也可以通过分布式多路音频混频器310经由网络发送，这样其他想要接收这个数据流的节点可以订阅它，并且在他们的媒体处理结点将其与本地的数据流混合在一起。 The mixed output audio mixer 310 may be transmitted via a network in a distributed multiplex, so that other node wants to receive the data stream may subscribe to it, and mixed them with the media processing node will be a local data flow together. 这种方法使得全球基础设施引擎104能够向以分散方式位于VMR的视频会议中的参与者提供混合视频输出。 This method enables global infrastructure engine 104 can provide a mixed video output to a video conference in a dispersed manner in participants located VMR. 在一些实施例中，如图5所示，所述音频代码转换器/预处理器308能够使以最佳的采样率混合来自多个编解码器的音频信号得到高扩展音频成为可能。  In some embodiments, as shown in FIG. 5, the audio transcoder / pre-processor 308 to enable the optimum sampling rate of the mixed audio signals from the plurality of codec extended audio it becomes possible to obtain a high . 更具体地，所述音频代码转换器/预处理器308基于与特定VMR中的参与者相关的视频终端，首先确定出可能的最佳采样率去混合音频。 More specifically, the audio transcoder / processor 308 based on pre-associated with a specific participant in the VMR video terminals, first determine the best possible audio sampling rate demixing. 然后音频转码器/预处理器308估计进入每个通道上的噪声，并确定每个通道上的语音活动。 The audio transcoder / preprocessor 308 into the estimated noise on each channel, and determine the speech activity on each channel. 只有活动的通道被混合以消除VMR的所有噪音，并且该通道是均衡地来增强信号和降低噪音。 Only channel activity are mixed to eliminate all noise VMR, and the channel is balanced to enhance the signal and reduce noise. 最终，音频转码器/预处理器308通过通道的标准化混合了所有的通道，并且基于VMR中所有其它的音频流为每个参与者创建唯一的数据流以消除通道上的回音。 Finally, the audio transcoder / processor 308 pre-mixed by a standardized passage of all channels, and all other VMR audio streams create a unique data stream to cancel echo for each participant based on the channel. 在一些实施例中，音频转码器/预处理器308能够提供实时进行语言翻译和其他语音到文本或语音到视频的转换服务，这些服务包括但不限于英语语言翻译和字幕的实时翻译、在通话中通过语音指令互动和修改内容以及通过语音到视频服务从互联网实时引入数据。  In some embodiments, the audio transcoder / processor 308 capable of providing pre-real time language translation and speech, or other speech-to-text conversion to video services, which include but are not limited to English language translation of subtitles in real-time and translation, interactive voice command during a call and to modify the content and video services into real-time data from the Internet by voice. 如果终端的自然损耗大于24分贝，没有必要去做回声消除。  If the natural loss of the terminal is greater than 24 decibels, it is not necessary to do echo cancellation. 对于视频会议，传统的方法是建立一个基础设施，为满足这些要求往往需要使用FPGA (现场可编程逻辑阵列）和DSP (数字信号处理器)定制硬件去实现低延迟媒体处理，并将硬件链接起来共同处理大的负荷。  For video conference, the conventional approach is to establish an infrastructure, to satisfy these requirements often require the use of FPGA (Field Programmable Gate Array) and a DSP (Digital Signal Processor) custom hardware to achieve low-latency media processing, and hardware link together to handle large loads. 这样的一个自定义硬件系统在AA/格式和通信协议中不是很灵活的，由于所述硬件逻辑和DSP编码是为一组特定的AA/编解码器和格式编写和优化所以它能处理。 Such a custom hardware in AA / formats and communication protocols are not very flexible, since the hardware logic and DSP code is written and optimized for a particular set of AA / codecs and formats it can handle. 建立该系统是非常昂贵的，它需要大量的研发团队和多年的设计周期与专业的工程技术。 The establishment of the system is very expensive, and it requires a lot of R & D team and years of design cycles and engineering expertise. 支持图1所示的所述VMR引擎102的操作需要一个多协议视频桥接方案，如业界所熟知的多点控制单元，以及前述讨论的媒体处理节点，以处理和构成来自各种不同终端的视频会议源。  FIG support the VMR engine 1 shown in operation 102 requires a multi-protocol video bridging solutions well known in the industry as a multipoint control unit, and a media processing node previously discussed, and various processes to form different from video conference source terminal. 传统地，一个MCU是通过将特殊的FPGA (现场可编程逻辑阵列）和IOOs的DSP (数字信号处理器)配合在一起的由自定义硬件建立的，最终形成昂贵的刀片框架安装系统中的具有许多数字信号处理器板的多点控制单元。 Conventionally, a MCU is together by a custom built hardware, eventually expensive blade frame mounting system has a special by an FPGA (field programmable logic array) and IOOs a DSP (digital signal processor) with many multi-point digital signal processor board of the control unit. 即便是这样如此昂贵的系统，当参与者使用HD视频时它连接到M⑶也仅仅能实现I Os或IOOs的速度。 Even so such an expensive system, when a participant is connected to it using the HD video M⑶ only able to achieve a speed I Os or IOOs. 为了达到更大的的范围，服务供应商不得不购买许多这种刀片箱子并且将负载平衡器和自定义脚本放在一起。 In order to achieve a greater range of service providers have to purchase many of these blade boxes and load balancers and custom scripts together. 但是该方法是非常昂贵的且难以实施，很难对DSP软件和使用的FPGA代码编程并且很难在全球范围内无缝分发。 However, this method is very expensive and difficult to implement, difficult to FPGA and DSP software programming code is difficult to use and seamlessly distributed worldwide. 此外，该系统通常运行专用的操作系统，这就使得很难添加第三方软件和迅速的提供新的特征以及一些功能，这样当虚拟会议室跨越多个MCU时，为虚拟会议室中的参与者提供灵活的影像合成的能力就丧失了。 In addition, the system typically runs a dedicated operating system, which makes it difficult to add third-party software and provide new features as well as some of the features fast, so that when a virtual meeting room across multiple MCU, participants in the virtual meeting room provide flexible image synthesis capability is lost. 如图1所示的实施例，所述全球基础设施引擎104能够使得通过建立MCUs (Multipoint Controler Units，多方控制单元)作为媒体处理节点，利用非定制(off-the-shelf，或称为现成的）部件，例如用Linux/x86的CPU (中央处理器)和PC的GPU (图像处理器） 来代替定制硬件，处理媒体流，来有效的和可扩展的处理和合成媒体流。 Embodiment illustrated in  FIG 1, the engine 104 can be a global infrastructure by establishing that the MCUs (Multipoint Controler Units, multi-control unit) as a media processing node, using a non-customized (off-the-shelf, or said ready-made) member, for example Linux / x86 CPU (central processing Unit) and the GPU a PC (image processor) hardware instead of customized, media stream processing, and to effectively handle and synthetic scalable media streams. 这些MCU可以以堆叠式(rack-and-stack)云计算风格被部署，从而实现以最具扩展性和性价比高的方法来支持VMR服务。 The MCU can be deployed in cloud computing stacked (rack-and-stack) style, in order to achieve the most cost-effective and scalable approach to support VMR service. 过去的5年中在数字信号处理(DSP)功能方面，所述x86结构已经有了极大的提高。 Over the past five years in digital signal processing (DSP) functions, the x86 architecture has been greatly improved. 此外，现有的用于渲染PC图形的图像处理器(GPU)可以用来增强CPU的处理能力。 Further, the conventional image processor (GPU) for rendering graphics may be used to enhance PC CPU processing capacity. •建立资金效率和运行成本效率。  • establish capital efficiency and operating cost efficiency. 在一些实施例中，全球基础设施引擎104能够将本地局域网上的以及跨地域的x86 服务器集群作为MCU的媒体处理节点300,以实现接近无限的扩展。  In some embodiments, the engine 104 can be a global infrastructure, and the cross-regional x86 server cluster on a local area network media processing node 300 as the MCU, to achieve nearly unlimited scalability. 所有的媒体处理节点300 作为一个巨大的MCU协同工作。 All media processing node 300 as a huge MCU work together. 在一些实施例中，例如这些聚集的MCU的设计利用网络层多路传送和一种新颖的多比特率的数据流分布方案来实现无限扩展。 In some embodiments, for example, data flow distributor design using the multiplex scheme of the aggregates of the MCU and the network layer of a novel multi-bit rate to achieve unlimited expansion. 在这种设计下，全球基础设施引擎104能够根据每个通话参与者的数量、呼叫者的地理分布和跨越全世界多个POP 协议的呼叫的分布实现极大的可扩展性。 In this design, Global Infrastructure engine 104 enables great scalability based on geographical distribution and the distribution of call around the world across multiple POP protocol number of participants for each call, the caller's. 在一些实施例中，全球基础设施引擎104在第三方数据中心通过接入点（Points of PreSenCe，P0P)方式在全球分配所述MCU以处理有着不同通信协议的视频终端的视频会议源。  In some embodiments, global infrastructure data center in a third engine 104 through an access point (Points of PreSenCe, P0P) mode to the global distribution of the video processing MCU video terminals have different communication protocol session source . 每个POP有着所要求的能够处理来自所述接入点所在的地理区域的负载的处理能力例如服务器）。 Each of the processing capability of the load with the required POP capable of processing from the access point where the geographic area such as a server). 用户或参与者连接到所述视频会议系统100并被所述全球基础设施引擎104 引导到最近的POP(连接器）以便他们最小化他们的延迟时间。 Users or participants of the video conference system connected to the global infrastructure 100 and engine 104 to the nearest guide POP (connector) so that they minimize their delay. 一旦参与者到达所述全球基础设施引擎104的POP，他们的音频和视频流会议源可以在所述POP间的高性能网络继续。 Once the participants reach the POP Global Infrastructure engine 104, stream their audio and video conferences can continue to source high-performance network between the POP. 这样分布的全球基础设施引擎104使得有史以来建立的最大的媒体处理引擎(VMR引擎102)作为一个单一系统100来运行。 Global Infrastructure engine 104 such that the distribution of the largest ever establishing a media processing engine (VMR engine 102) 100 as a single system to run. 如果使用传统的基于DSP/FPGA自定义硬件的方法建立，该系统需要大量的资本、研发成本和巨大的匹配的操作脚本。 If you use based on the traditional DSP / FPGA hardware way to create a custom, the system requires a lot of capital and R & D costs and huge match action script. 图7A-7C描述都来自一个POP的本地局域网的或者在广域网上跨越多个POP的多相位媒体流分配过程的例子。 Examples of the media stream distribution process or the  description of FIG. 7A-7C are a POP from a local LAN across a wide area network in a plurality of multi-phase POP. 如图7A所示，其描述媒体流分布阶段一，具有一个POP的单节点媒体分布，在该阶段中，举个非限制性例子，来自一个视频会议的参与者的视频会议源通过，运行H. 323的会议室系统、运行H. 323的PC、运行Skype的PC，根据邻近会议主机的原则， 其全部连接到POP内的一个节点，在该阶段中，所述视频会议源是负载平衡的但不聚集在POP节点之间。 As shown in FIG 7A which describes a media stream distribution phase, with a single-node POP distribution media, in this stage, the way of non-limiting example, the video conference participant from a source through a video conference, running H room systems. 323, H. 323 running the PC, the PC running the Skype, adjacent the conference host according to the principle, which is connected to all nodes within a POP, in this stage, the source is a video conference load balancing but does not collect between POP nodes. 图7B描述媒体流分布阶段二，具有一个POP的聚集节点媒体分布，其中来自参与者的视频会议源在POP中聚集的节点之间是负载均衡的，并且所述音频/视频流在POP中的节点之间是分散的/溢出的。 7B depicts a media stream distribution stage two, a POP having a rendezvous media distribution, wherein between the source of the video conference participant from aggregation in the POP nodes are load balancing, and the audio / video stream in the POP dispersed / overflow between nodes. 图7C描述媒体流分布阶段三，在具有POP的聚集节点和不同的POP之间均完成媒体分配，在该阶段，一些会议的参与者可以连接到距他们最近的POP而不是一个单一的POP。 FIG. 7C depicts a media stream distribution Phase III, complete media was partitioned between POP aggregation node and having different POP, at this stage, a number of conference participants may be connected to a single, rather than from their nearest POP POP. 在一些实施例中，所述全球基础设施引擎104将允许多个其它全球分布式专用网络去连接它，其中包括但不限于对视频会议服务的部署:如微软的Lycn聊天工具要求在边缘节点处联合(例如多个组织机构之间的合作）、以及几个通讯和传输协议的转换和解码。  In some embodiments, the infrastructure of the global engine 104 allows a plurality of other global distributed private networks to connect it, including, but not limited to, the deployment of video conferencing services: such as Microsoft Messenger requires Lycn joint edge node (e.g., the cooperation between multiple organizations), and a conversion and transmission and decoding of several communication protocols. 在一些实施例中，全球基础设施引擎104可以限制来自一个视频会议的每个参与者的视频会议源最多只能通过系统中的媒体节点和/或POPs的两个跃点。  In some embodiments, global infrastructure engine 104 may limit the source of each video conference participant video conference from a maximum of two hops through the media system nodes and / or POPs. 然而，可能获取具有执行编码转换和编码转发的中间媒体处理节点的其它层级。 However, it is possible to obtain an intermediate level other media processing node performs encoding and transcoding forwarded. 使用这个方案，全球基础设施引擎104能够向参与者提供与不支持可扩展视频编码(SVC)的设备相关联的伪可扩展视频编码，例如视频会议的每个参与者支持具有适当比特率加速/减速能力的音视频编码(AVC)。 Using this scheme, a global infrastructure 104 can provide the engine with the participants do not support scalable video coding (SVC) pseudo device associated with scalable video coding, video conferencing, for example, each participant support having an appropriate bit rate acceleration / deceleration capacity of audio and video coding (AVC). 在媒体分布式网络中，所述全球基础设施引擎104取得所述的AVC数据流并将他们改编为多比特率AVC数据流。 In a distributed media network, the Global Infrastructure engine 104 acquires AVC data streams and their adaptation to the multi-bit rate AVC stream. 根据所述方案，仍然可以在支持SVC的设备上使用SVC，随着参与者客户端设备对SVC采用的增加以及这种网络的采用和成长，也可能在在内部网络使用SVC 而不是多比特率AVC数据流。 According to the embodiment, may still be used on a support SVC SVC devices, and grow with the introduction of participant client devices using SVC increases and such a network may also be used instead of multiple SVC bit rate within the network AVC data stream. 当到达服务器的输入是通过一个开放性的网络尤其是不受信任的资源接受的时候，为了防止安全漏洞、拒绝服务攻击和服务的不稳定性必须对输入进行验证。  When the input reaches the server is through an open network, especially untrusted resources accepted, in order to prevent security breaches, denial of service attacks and instability service must validate input. 在视频会议情况下，需要验证从一个会议终端输入的音频/视频流，所述验证包括控制协议信息和压缩的媒体流，这两者必须进行验证。 In a video conference, the need to validate the audio input from a conference terminal / video stream, the media stream comprising a verification protocol control information compression, both of which must be verified. 编码对不信任的输入的处理是负责在其进入系统传播之前，对不信任的输入的验证和清楚检查，这点很重要。 Distrust of the encoding process is responsible for input into the system before it spread distrust of input validation checks and clear, it is very important. 历史已经表明依靠这作为唯一的验证对策是不够的。 History has shown that rely on it as the only validation strategy is not enough. 对于一个非限制性的例子，H.323大量的利用抽象语法标记法一(ASN.1)进行编码，几年来，大多数公用ASN.1的实施有一些安全问题，ASN.1的复杂性使得它几乎是不可能去手编一个完完全安全的解析程序。 For a non-limiting example, H.323 using a large amount of an Abstract Syntax Notation (ASN.1) encoding the years, most common embodiment of the ASN.1 some security issues, such complexity of ASN.1 it is almost impossible to finish a hand made completely safe resolver. 对于另一个非限制性例子，许多H.264视频解码器的实施不包含由于性能原因的边界检查，反而包括当它执行一个无效的存储读取并触发故障时去重新启动编解码器的系统特定的代码。 For another non-limiting example, many embodiments H.264 video decoder is not included due to performance reasons bounds checking, including but when it performs a memory read invalid and cause the fault to restart a particular codec system code. •单独进程:每个正进入的连接都应该要引起一个由协议连接器创建处理的新的进程。  • a separate process: each positive incoming connections should be caused by a new process created by the protocol processing connector. 所述进程将要负责解压缩进入的媒体流、将进入的控制信息转换为内部API呼叫和将所述媒体解压缩为一个内部未压缩的形式。 The process will be responsible for decompressing the incoming media stream, it will enter into internal control information and the media API calls decompresses an internal uncompressed form. 对于一个非限制性例子，入站的H.264视频在传递到另一个进程之前可以被转换成YUV420P帧。 YUV420P may be converted into a frame prior to the non-limiting example, in the H.264 video inbound to the other process. 这样做的目的是，如果这个进程崩溃，系统的其他部分将不会受到影响。 The purpose of this is, if it crashes, other parts of the system will not be affected. •独立进程:每个连接都应该在自己的进程中处理。  • Independent process: Each connection should be handled in its own process. 一个给定的进程应该仅仅负责一个视频电话终端，因此，如果这个进程崩溃，只是单个终端受到影响，而系统的其他人不会注意到任何事情。 A given process should only be responsible for a video phone terminal, so if it crashes, just a single terminal affected systems while others will not notice anything. •非特权进程:每个进程应尽可能与系统的其他部分相互独立。  • unprivileged process: Each process should as far as possible with the rest of the system independent of each other. 为了做到这一点， 理想上是每个进程最好通过自己的用户证书运行，并且可以使用改变根目录系统调用使得大部分文件系统无法访问。 To do this, the ideal is best for each process running through their user credentials, and can be used to change the root of the system call makes the most of the file system inaccessible. •性能方面注意事项：协议连接器将要引进一些进程，在这些进程中通常只有一个存在时将带来性能下降的可能性，特别是在处理音频和视频流的系统中在进程之间需要移动大量的数据。  • Performance Considerations: protocol connector will introduce some of the process that will bring the possibility of performance degradation when usually only one exists in these processes, especially in the system processes the audio and video streams in the process between We need to move large amounts of data. 为了实现这个目的，可以利用共享内存设施以减少需要复制的数据量。 To achieve this purpose, you can use shared memory facility to reduce the amount of data that needs to be replicated. •在可靠和不可靠的传输机制下具有直接单播、广播、多路广播和任播流量的能力。  • has the ability to direct unicast, broadcast, multicast and anycast traffic in reliable and unreliable transport mechanism. •平衡访问媒体处理节点的服务请求与敏感内容或空闲服务器分类之间的负载的能力。 Load capacity of between idle servers with sensitive or classified  • balanced access to the media processing node service request. •不管程序是否崩溃都能够传输信息的同步和异步传输机制。  • regardless of whether the program crashes are able to transmit synchronous and asynchronous transfer mechanism of information. •包括使用有效的扇出技术进行原子广播的基于优先级和时间顺序传输机制。  • comprises using an effective fanout atoms broadcasting technology based on priority and time-sequentially transport mechanism. •利用单写和原子广播实现一个有效的扇出的能力。  • using a single atomic write and broadcast the ability to achieve an effective fan-out. •有选择地放弃非实时排队的信息以提高实时响应的能力。  • selectively abandon non-real time queue information to improve the ability of real-time response. •具有放弃未传输的非实时事件能力的基于优先级的排队机制。  • have the ability to give up non-real-time events not transmitted priority queuing based. •一个事务意识消息系统。  • sense of a transaction messaging system. •基于会议室、IP地址、进程名和进程号等内容与一个分层条目的命名系统集成。  • Integration with a hierarchical naming system based on the content of the conference room entry, IP addresses, process name and process ID and so on. 传统地，所述视频会议参与者的传统视频终端，如使用H. 323协议的视频会议终端，其主要与企业或组织机构的局域网内的其他终端连接。  Conventionally, the video conference participant conventional video terminal, such as the H. 323 protocol using the video conference terminal, which is connected to the other main terminal in the business or organization's local area network. 人们曾多次尝试使H. 323终端穿过防火墙与企业网络外部的终端进行无缝通讯，其中一些防火墙已经在ITU协议中被标准化的防火墙扩展至H. 323，称之为H. 460.17，18，19，23，24，而其他一些被视频会议设备供应商采用的尝试，包括在公司网络的DMZ中去部署网关硬件或软件。 It had been several attempts to make the H. 323 terminal through the firewall and outside the corporate network terminals communicate seamlessly, some firewalls have been standardized in the ITU agreement firewalls extended to H. 323, called H. 460.17,18 , 19,23,24, while others try to be using video conferencing equipment suppliers, including companies in the DMZ network to deploy a gateway hardware or software. 然而，事实证明这些尝试没有一个是成功的，组织间的通话一直是繁琐的，并且只能通过繁重的IT的支持和参与来进行。 However, the fact that none of these attempts is successful, the call between organizations has been cumbersome, heavy and can only be carried out by the support and participation of IT. •将所有从位于防火墙外的终端呼出的视频会议限制到全球基础设置引擎104的一个服务器上，其中该服务器能通过一个每个用户都可访问的网络上的公共的IP地址获得。  • all exhaled from the video conference terminal is located outside the firewall to limit set based on a global server engine 104, wherein the public IP address of the server accessible via a network each user is obtained. •保持一系列用于到达全球基础设施引擎104的UDP/IP端口，并且全球基础设施引擎104通过该一系列UDP/IP端口将媒体分配到一个小的指定的端口子集。  • maintaining a series of global infrastructure for the arrival UDP 104 engine / IP port, and Global Infrastructure engine 104 through the series of UDP / IP port media assigned to a small subset of the specified port. 这使得具有严格防火墙政策的公司，与完全打开防火墙相比，只是在一个相对狭窄的范围打开防火墙。 This makes the company has strict firewall policy, compared to fully open the firewall, just open the firewall in a relatively narrow range. •提供了一个简单的基于Web浏览器的应用程序，该应用程序允许任何用户都可以轻松运行一系列的检查以确定公司防火墙的性能和行为，并且确定使用H. 323终端时防火墙是否是一个问题或需要变更任何规则。  • provides a simple Web browser-based application, and the application allows any user to easily run a series of checks to determine the corporate firewall performance and behavior, and the use of H. 323 terminal to determine whether the firewall is a problem or need to change any rules. •提供一个增强的基于浏览器的应用程序，所述应用程序作为一个隧道代理服务器使任何用户能在浏览器或本地PC操作系统上运行软件，以允许终端将所述软件隧穿到一个或多个互联网上的公共服务器。  • provide an enhanced browser-based application, the application as a tunnel proxy server so that any user can run the software on a local PC browser or operating system, to allow the terminal to the tunneling software one or more public server on the Internet. 可选择地，所述软件能以独立的方式在任意PC或本地的或虚拟的网络上的服务器上运行，形成代理服务器以实现同样的隧穿。 Alternatively, the software can run on any PC or server on a local network or virtual in an independent manner, is formed to achieve the same proxy tunneling. •与视频会议终端的物理交互。  • physical interaction with the video conferencing terminals. 用户体验引擎106能够以一种独立于设备/制造商的方式控制一个VMR中的多方通讯视频会议的建立和管理。 Users can experience engine 106 in a device-independent / manufacturer controls the establishment and management of a multi-party communication VMR video conferencing. 大部分与制造商提供的远程控制的物理交互可以归入web应用程序，其中所述web应用程序可以从任何计算机或通讯设备中启动，包括膝上型电脑、智能手机、平板电脑。 Most physical interaction with the manufacturer's remote control can be classified as a web application, wherein the web application can be launched from any computer or communications devices, including laptop computers, smart phones, tablet PCs. 在一些实施例中，鉴于基于互联网/云的软件能够将这些交互识别和转化成可操作事件，这些交互也可以通过语音或视觉命令驱动。 In some embodiments, in view of the Internet-based / cloud these interaction recognition software and converted to actionable event, these interactions may be driven by voice commands or visual. •与web应用程序相关的用户界面(Ul)控制参与者与所述VMR引擎102的相互交流。  • a web application associated with a user interface (Ul) to control the exchange participants VMR engine 102. 此处，用户体验引擎106控制主持人与会议参与者之间的互动。 Here, the user experience engine 106 controls the interaction between the presenters and conference participants. 通过用户体验引擎106提供的一个直观的用户界面(Ul)，视频会议的参与者能够控制诸如视频布局、静音参与者、发送聊天信息、共享屏幕和添加第三方视频内容等特征。 User experience engine 106 provides an intuitive user interface (Ul), video conference participants can be controlled such as a video layout, muting participants, sending chat messages, screen sharing feature and add third-party video content. •视频/多媒体内容：用户体验引擎控制，在视频会议期间以及当参与者登录到一个VMR中在屏幕上实际看到的，以屏幕输出、合成会议源、欢迎条幅等形成呈现的内容。  • video / multimedia content: the user experience engine control, during a video conference and presented when participants log on to form a VMR actually see on the screen in order to screen output, synthetic conference source, welcome banners and other content . 在一些实施例中，所述用户界面Ul和/或多媒体内容可能包含与参与者的呼叫体验的性能指标相关的信息，这些信息包括但不限于视频分辨率、视频和音频比特率、连接质量、连接数据包丢失率、作为呼叫结果获得的碳补偿，节省的交通费用，以及与传统的基于微处理器MCU 呼叫相比节省的费用。 In some embodiments, the user interface Ul and / or multimedia content may include performance metrics associated with the call participants experience information, the information including but not limited to video resolution, video and audio bit rate, the quality of the connection, connectionless packet loss rate, call offsets as the results obtained, saving transportation costs, and the cost compared with the conventional microprocessor-based MCU call savings. 这也是一种环保的解决方案，例如可以节省不频发的飞行旅程或为同样的行驶里程所花费的金钱以及与飞行状态水平相似的各种状态水平相关联的炫耀的权利。 It is also an environmentally friendly solution, for example, can save infrequent air travel or mileage for the same money spent as well as flight status similar level of bragging rights associated with the various state levels. 可以根据获得的状态的不同水平制定激励程序，鼓励参与者使用与旅游会议相对的视频会议。 Incentive programs can be developed according to different levels of available state, encourage participants to use video conferencing and Tourism Conference relative. 这对于他们在商业利益上使用视频会议给予个人奖励。 They use it for video conferencing on a personal award given to commercial interests. •自定义具有特殊应用程序的视频会议(例如纵向行业）。  • Custom has a special video conferencing application (such as vertical industry). 为了使视频会议满足特殊行业的需要，用户体验引擎106允许用户自定义VMR，这就使得会议参与者可以体验新水平的协作和会议的有效性。 In order to meet the needs of special video conferencing industry, user experience engine 106 allows the user to customize the VMR, which makes meeting participants can experience a new level of collaboration and the effectiveness of the meeting. 这些纵向行业或专业包括但不限于雇佣和招聘、远程教育、远程医疗、安全法律口供、例如运动、音乐会、客户支持等即时事件的共享查看等。 These vertical industry or profession, including but not limited to hiring and employment, tele-education, tele-medicine, security, legal statements, such as shared sports, concerts, and other real-time customer support and other events to see. •根据每个主持人和/或参与者的喜好和特权个性化VMR。  • personalized according to each VMR moderator and / or participant preferences and privileges. 当安排视频会议时，用户体验引擎106为主持人提供能够个性化会议的能力。 When scheduling a video conference, a user experience engine 106 provides the ability to personalize the conference moderator. 这些自定义的实例包括但不限于初始的欢迎横幅、议程表上传、指定将要用在会议中使用的视频布局和给会议参与者特权。 These customizations include, but are not limited to, the initial welcome banner, upload agenda, specify the video layout and to use the conference participants will use the privilege in the conference. 尽管大部分传统的视频会议系统耗资数十万美元，但他们在会议期间为会议的组织者，或者给参与者在控制用户体验方面提供非常有限的自由度和灵活性。  Although most traditional video conferencing systems cost several hundred thousand dollars, but they are during the meeting for the organizers of the meeting, or to provide participants with a very limited degree of freedom and flexibility in controlling the user experience. 布局来自预先配置的几个选择的选项，并且在通话期间可以修改的设置也是有限的。 Layout option select from several pre-configured, and can be modified during the call setup is limited. 在一些实施例中，在参与者通话期间，用户体验引擎106提供主持人发起的会议内的在安全和隐私设置上的管理和控制，其中所述的管理和控制特征包括但不限于，静音视频会议中的一个特定的讲话者、控制和/或向所有人或者部分参与者广播与一个视频会议终端相关的布局、与部分参与者有选择地共享额外的材料(对于非限制性实施例，在一个人力资源纵向应用程序中，其中多个面试官在一个普通的呼叫中面试候选人）。  In some embodiments, the participants during a call, the user experience engine 106 provides management and control over security and privacy settings within the host initiated session, wherein said management and control features include, but are not limited to mute a particular video conference speaker, control and / or to all or part of a participant broadcasting the video conference terminal associated with the layout of the partial participant selectively share additional material (for non-limiting embodiment embodiment, in a vertical application of human resources, wherein the plurality of candidate interviews the interviewer in an ordinary call). 1.在他/她的会议终端的屏幕上显示哪一个活动的VMR会议的活动的参与者他/她的视频窗口。  1. Activities VMR meeting which activities displayed on the screen of his / her terminal conference participant his / her video window. 2.不同的参与者在他/她的会议终端的屏幕上应该如何布置的选项。  2. The different players on the screen of his / her how to arrange the conference terminal options. 3.在哪里和如何在他/她的会议终端的屏幕上查看第二视频信道(屏幕共享、演示共享、共同观看其他内容)的布局选项。  3. Where and how to view the second video channel on the screen of his / her conference terminal (screen sharing, presentation sharing, co-viewing other content) layout options. 使用这种会议内控制，主持人可以通过现有技术所不允许或不提供的方式控制特定通话的安全和隐私设置。  Using the control within this conference, the host can not provide a manner not allowed or control particular call security and privacy provided by the prior art. 1.通话过程中静音部分参与者。  1. The partial participant mute a call. 2.在呼叫过程中和部分参与者共享内容。  2. During a call, and some participants share content. 3.规定一个他/她的视频会议终端屏幕的标准的布局和一些其它参与者能看到的显不的呼叫者。  3. The provisions of one of his / her standard video conference terminal screen layout and some of the other participants were not able to see the caller. 4.选择在部分参与者的各自的视频窗口中显示呼叫者说明的元数据，包括用户名称、网站名称和任何其他元数据。  4. Select the caller display the metadata described in the portion of the respective participants in the video window, including a user name, site name, and any other metadata. 5.通过一个实时、动态web界面以轻松和无缝的方式添加和删除视频会议呼叫的参与者。  5. Through a real-time, dynamic web interface to add and remove participants in a video conference call with easy and seamless way. 6.轻松定制向加入呼叫的视频呼叫者显示的欢迎屏幕，可以显示呼叫的相关信息以及服务商提供商或者或呼叫主持人希望参与者看到的任何音频或视频材料。  6. easily customize the welcome screen to join the video call callers can display information about the call and any audio or video material or service provider, or call providers want to host the participants to see. 在一些实施例中，用户体验引擎106通过在主VMR中创建子房间能够使VMR中的私人会议成为可能，任意子集的参与者可以加入该私人会议并进行私人聊天。  In some embodiments, the user experience engine to create a sub 106 in the main room by the VMR VMR enable the private meeting possible, any subset of the participants may be added to the private meeting and private chat. 对于一个非限制性实施例，参与者在保持在主VMR中的同时，可以邀请其他人进行一个快速的音频/视频或文字交谈。 For a non-limiting embodiment, while maintaining the main participants in the VMR can invite others to a fast audio / video or text chat. 在一个视频会议的参与者之间的分享经验活动通常要求同一个地方的所有的参与者是实际存在的。  events to share experiences among participants of a video conference usually requires all participants in the same place is real. 否则，当它发生在互联网上时，往往质量是非常差的，实现这一技术所必须的步骤对于一个一般人而言想要把它变成实际可行的技术是相当有挑战性的。 Otherwise, when it occurs on the Internet, often the quality is very poor, this technology implementation steps necessary for a general who wants to turn it into a practical technology is quite challenging. 在一些实施例中，用户体验引擎106提供了通过VMR协同浏览事件，这些事件是可以预定并且在参与者之间共享的，这样他们能够体验同时多人参与一件事情的乐趣，并且通过视频会议一起分享该体验。  In some embodiments, a user experience engine 106 provides a collaborative browsing through VMR events that can be scheduled and shared between participants so they can experience the fun of participating in more than one thing at the same time, and Share this experience together via video conference. 对于一个非限制性实施例，所述共享的事件可以是一场人们希望与朋友们一起享受的超级杯比赛、或一群朋友一起观看一些电影预告片的快速会话，从而决定将要去电影院观看哪个。 For a non-limiting example, the shared events can be a quick conversation Some people want to watch movie trailers with friends and enjoy together the Super Bowl, or a group of friends together, so decided to go to the cinema to watch what. 在一些实施例中，如图12中的实施例所描述的，用户体验引擎106利用全球基础设施引擎104中的MCU提供一个事件共享的方便、快捷和高质量的解决方案。  In some embodiments, as shown in Example 12 described in the embodiment, the user experience engine 106 utilizes global infrastructure engine 104 provides an event shared MCU convenient, fast and high-quality solutions. 更特别地，用户体验引擎106使呼叫发起者1202邀请一群其他参与者1204通过web界面1206共享VMR中的视频会议。 More particularly, the user experience engine 106 to make the call originator 1202 1204 hosted a group of other participants via a web interface shared VMR video conference 1206. 一旦加入到VMR中的web界面1206中的每个人共享在线视频和内容，然后发起参与者1202可以呈现需要共享的内容所在的网站的链接，并且所述内容直接从内容源流入同样的VMR，不管该内容是与发起参与者1202在一起的，还是位于网络上的第三方网站或内容服务器上。 Once added to each person in the web interface VMR 1206 in the online video and content sharing, then launched participant 1202 may present links to websites where the content needs to be shared, and the contents flow into the same VMR directly from the content source, regardless of the content is initiated by participants together with 1202, or on third-party sites or content located on a network server. 参与者1202可以在观看内容1210的同时继续与其他参与者1204进行对话，这些观看内容的特征包括但不限于，例如哪里可以看见、它的音频级别、是否需要消音、是否暂停或暂时移除等各种项目的布局，这些是由共享这些内容1210人控制，类似于上述讨论的视频会议主持人管理和控制视频会议的控制。 1202 participants can continue while viewing the content with other participants 1210 1204 dialogue, to view the content of these features include, but are not limited to, for example, where you can see, it's the audio level, the need for silencers, such as whether to suspend or temporarily removed the layout of the various projects, which are controlled by the 1210 people share content, similar to video conferencing host control management and control of video conferencing as discussed above. 该方法提供一种引人注目的和新颖方式使分布在世界各地中还想要一起经历一个事件的一群人来观看现场直播。 The method provides a compelling and novel manner distributed around the world also want to experience together a group of people to watch the event live. 这就使得围绕在主动参与现场直播事件周围的一整套新的应用程序成为可能，这种现场直播事件包括例如会议或结婚等社会事件。 This makes it a whole new set of applications surrounding the active participation of live events as possible, including such live events and other social events such as meetings or wedding. 在一些实施例中，用户体验引擎106能够实现多视图显示和视频会议的参与者的设备无关控制。  In some embodiments, the user experience can be achieved engine 106 and multi-view display device video conference participants independent of control. 此处，所述每个视频终端都有它自己的用户界面并且在会议室中对于硬件视频系统是可用的，所述每个视频会议终端都有一个不容易使用的远程遥控。 Here, each of the video terminal has its own user interface and in a meeting room for a hardware video systems are available, each of the video conferencing terminals are not easy to use a remote control. 为了使连接VMR的用户体验简单，用户体验引擎106最大限度地减少了需要利用本地界面实施的操作， 并将所有这些功能移动到大多数用户熟悉的装置中运行的界面，这些用户熟悉得装置包括例如台式电脑、笔记本电脑、移动电话或移动平板电脑，通过这些使得用户体验尽可能独立于终端装置用户界面功能而去控制VMR。 In order to connect the VMR simple user experience, user experience engine 106 minimizes the need to use the local operator interface of the embodiment, and all of these features to the mobile interface means familiar to most users running, these users have to be familiar with means comprises such as a desktop computer, a laptop computer, a mobile phone or mobile tablet, so that the user experience through which a terminal device independent of the user interface control function as away VMR. 通过这种与设备无关的视频会议控制，用户体验引擎106提供了灵活性、易于使用、丰富的体验和扩展功能，它使得这种体验对于参与者来讲是远过个人的并且是很有意思的。 With this device-independent video conference control, user experience engine 106 provides the flexibility, ease of use, rich experience and expansion capabilities, it makes the experience for the participants in terms of far too personal and is very interesting . 在一些实施例中，用户体验引擎106也可以让参与者使用多设备/视频会议终端来参与和/或控制视频会议。  In some embodiments, the user experience engine 106 may allow participants to use multiple devices / terminals to participate in a video conference and / or video conference control. 在一台设备，例如视频会议室系统上，参与者可以接受音频和视频流。 In one device, for example, a video conference room system, participants can accept the audio and video streams. 在另一台设备，例如笔记本电脑或平板电脑上，参与者可以发送/接受演示材料、聊天信息等，并且还可以用它来控制会议，如对一个或多个参与者静音、为演示需要使用画中画而改变视频会议终端屏幕的布局等。 In another device, for example, a laptop or tablet computer, a participant can send / receive presentation materials, chat information, etc., and may also use it to control the session, such as one or more participants to mute, to demonstrate the need to use PIP and change the layout of the terminal screen video conferencing. 笔记本电脑上的操作被反映到视频会议室系统，因为两者都连接到同样的托管的视频会议的VMR上。 Operating on the laptop is reflected in the video room systems, because both are connected to the same VMR video conference hosted. [0M7]目前，从H. 232终端接连一个视频会议往往需要通过对设备的远程控制来执行频繁的步骤。 [0M7] Currently, in succession from a H. 232 video conference terminals need to perform frequent often step on a remote control device. 除了逻辑问题，例如在请求的会议室定位远程遥控之外，还有从目录中获取正确的号码来呼叫、进入指定的代码进行远程呼叫等方面的学习曲线相关的问题。 In addition to the issue logic, e.g. positioned remote control request in a conference room, there are acquired the right to call a number from the directory, the learning curve into problems specified remote call code related to other aspects. 终端参与者以及桌面参与者在打开他们的视频装置加入议会时，直接被加入会议中。 Terminal participants and participant in the desktop video device when you open them to join parliament, directly added to the conference. 在一些实施例中，用户体验引擎106通过向参与者呈现欢迎屏幕提供了一个全新的方式以改善和简化用户体验，其中向参与者呈现的欢迎屏幕内容包括但不限于用于图14 的实施例中的视频会议的互动欢迎握手、闪屏、进入房间号码相关信息的交互、欢迎视频等。  In some embodiments, the user experience engine 106 provides a new way to improve and simplify the user experience by presenting a welcome screen to the participant, wherein the content of the welcome screen presented to participants including but not limited to 14 in FIG. Examples of interactive video conference welcomed the implementation of a handshake, splash screen, enter the interactive room number related information, welcome video. 为了从一个视频会议终端加入一个呼叫，主持人要做的所有事情就是需要呼叫他/她所订阅的个人VMR号码。 In order to join a video conference call from a terminal, all the things that need to do is call the host of his / her personal VMR number subscribed. 然后主持人可以设置呼叫的详细信息，所述信息包括形成和其他参与者欢迎握手部分的丰富的媒体内容，其可以被设置为主持人所主持的所有呼叫的默认选项。 Then host details of the call can be set, including the information form and other participants welcomed the handshake part of rich media content, which can be set to all the default options to host the auspices of the call. 其他参与者呼入VMR并且进入指定号码的房间进行会议呼叫。 Incoming VMR and other participants into the conference room designated number of calls. 在加入VMR时，他们首先享受设置为欢迎页面的丰富的媒体内容，包括会议内容说明，例如议程、各呼叫方的名称、公司相关统计数据等。 When adding VMR, they first set to enjoy the welcome page of rich media content, including meeting content description, such as agenda, names of the caller, the company relevant statistical data. 这些内容还可以是更通用的而非商业应用程序，包括视频、音乐、动画、 广告等任意flash内容。 The content can also be a more general rather than commercial applications, including any flash content video, music, animation, advertising and so on. 加入呼叫后，该显示还在参与者他/她的屏幕上显示一个对于参与者特定的代码，其可以用于为共享内容向会议传送内容。 After joining the call, the participants also displayed on his / her screen participants for a specific code, which can be used to deliver content to the meeting to share content. 所述代码也可以通过一个用于呼叫的web应用程序输入或通过声音或视觉指令运行，其中所述声音或视觉指令被互联网云中的软件识别和处理，然后转化为可执的事件。 The code may be input by a web application for a call by a sound or visual or operating instructions, wherein said instructions are visual or sound recognition software and the Internet cloud process, and then converted into executable events. •一旦连接对会议室的相机显示一些手势或模式。  • Once connected display some gestures to the camera mode or conference room. 上述所描述的体验也为任意参与者提供了不使用默认的打开音频或视频流的机会。  experiences described above also provides the opportunity to not use the default open the audio or video stream to any participant. 当所有参与者进入并且呼叫准备开始时，所述主持人可以在全球范围内开始该呼叫，并且每个参与者可以细微的控制是否开启/关闭他们的音频/视频。 When all the participants into the call and began to prepare, the host can start the call on a global scale, and each participant can control whether subtle turn on / off their audio / video. 在一些实施例中，当参与者等待时，这也允许提供货币化(monetizable)服务，例如对小范围的参与者、时区、人口以及由互联网云端的服务所决定的其他特征播放流媒体广告。 In some embodiments, when a participant waiting, which also allows the provision of currency (monetizable) services, for example, participants in a small range, time zone, and other demographic characteristics determined by the Internet service cloud play streaming media advertising. 在其他实施例中，当人们等待呼叫开始时，可以显示关于服务器中引入的新功能的视频，在其他实施例中，参与者在电话会议中的详细信息可以以丰富的多媒体格式被显示，现有技术中不可能有这种技术。 In other embodiments, when people began to call waiting, you can display video about the new features introduced in the server, in other embodiments, the details of the participants in the conference call can be displayed in rich multimedia format, now art can not have this technology. 目前，希望组织视频通话的消费者只有两种选择，要么选择使用H323终端的商业/ 专业选项，例如宝利通(Polycom)或泰德系统，或使用功能/质量有限的桌面应用程序，这种应用程序向用户显示参与者的邮票大小的视频，而且特别地，是显示在一个简单的或乏味的背景或界面上。  Currently, consumer organizations hope video calls are only two choices, either choose to use the H323 terminal business / professional options, such as limited Polycom (Polycom) or Ted system, or use the function / quality of desktop applications, which application that displays a video participants stamp size to a user, and in particular, is a simple or a boring background or interface. 为了解决这个问题，图15描述了用户体验引擎106提供个性化VMR允许参与者在每次通话基础上去自定义(或定制)或个性化他/她的会议体验，这些显著的转变、革命化和大众化了视频会议体验。  In order to solve this problem, Figure 15 depicts a user experience engine 106 to provide personalized VMR allows participants to his / her experience in meeting each call up a custom basis (or custom) or personalization, these significant changes, revolutionized and popularized video conferencing experience. 对于企业用户来说，用户体验引擎106在会议期间为通话寻找会议室，或者类似的专业设置和不同类型的背景、欢迎音乐、欢迎横幅、其他状态和聊天信息以及五彩纸带等提供布局和背景。 For enterprise users, user experience engine 106 during a conference call to find a room, or a similar professional settings and different types of background music are welcome, welcome banners, and other status information, and chat with multicolored paper tape to provide layout and background . 主持人能够从基于预定计划提供给他/她的一系列选项中挑选一个。  from the host can provide on a scheduled basis to give him / her a series of options to choose. 对于零售的消费者，所述体验将是更加非正式的和变化的。 For retail customers, the experience will be more informal and change. 呼叫者可以以任意他/她喜欢的方式装饰他/她的房间。 Callers can in any way she likes him / decorate his / her room. 参与者的用于VMR的个人网站可以同样地装饰和个性化。 Participants personal website for VMR may likewise be decorated and personalized. 在呼叫期间，用户体验引擎106可以提取或读入这些被参与者指定的可定制选项，并把他们置入这个定制VMR 中，这样这种体验比传统的呼叫体验更加丰富。 During a call, the user experience engine 106 can extract or read these designated participant customizable options, and put them into this custom VMR, so this experience richer experience than traditional calls. 通过互联网/云提供个性化会议服务具有在任意终端去除处理器计算能力的明显优势。  via the Internet / cloud conference to provide personalized service has obvious advantages removing processor computing power at any terminal. 只要终端能够接受和处理编码的视频流，用户体验引擎106能够对参与者提供任意级别的丰富媒体内容作为他们的部分呼叫体验，所有这些可以被VMR中的主持人控制和设置。 As long as the terminal can receive and process an encoded video stream, the user experience engine 106 can provide any level of rich media content to the participants as part of their call experience, all of which may be provided to control and moderator in the VMR. 对于一个两人对话，与传统的将双方并排显示的平面布局不同，用户体验引擎106 可以呈现3D布局，来自双方参与者的输入视频被设置成使他们看起来正在彼此看着对方， 这样视频会议中的其他参与者看到的对话更自然。  For a two-person dialogue with the traditional layout of the different parties displayed side by side, the user experience engine 106 can render 3D layout, the video input from both participants is set to make them look're looking at each other, other participants in this video conference saw more natural dialogue. 同样地，对于一个非传统性的应用程序， 例如远程医疗，或者病人可以和医生远程谈话的一个电话会议，所述的会议本身可以被做的像一个医生的办公室。 Similarly, for a non-traditional applications, such as a telemedicine conference call, or patients and doctors can remotely talk, the conference itself can be done like a doctor's office. 当患者在等待医生时可以观看一些健康相关问题的视频，一旦医生呼进来，这些体验可以模拟一个虚拟的医生的办公室访问。 When the patient while waiting for the doctor to view a video of some health-related issues, once the doctors call comes in, these experiences can simulate a virtual doctor's office visit. 其他的应用程序包括但不限于一些情景，例如招聘可能他们具有自定义的布局和看起来不一样的视频呼叫，其中在他们的视频中，被面试者的简历可以被面试官看到，并且简历可以被面试官编辑和注释，但是这可能是对被面试者是隐藏的。 Other applications include, but are not limited to, a number of scenarios, such as recruitment may have them look different layout and custom video calls, which in their videos, the interviewee's resume can be seen the interviewer, and resume the interviewer may be edited and annotated, but this might be the interviewee is hidden. —个“汇接”服务，例如我们的保留呼叫者匿名的服务，其允许他们从任意软件或硬件终端中呼入，而不被接听者发现呼叫人的任何个人身份信息。  - a "tandem" services, such as our anonymous caller reservations service, which allows them to incoming calls from any software or hardware terminal, without being the recipient find any personally identifiable information about the person calling. 目前，对于web用户来说一个最重要的痛点就是对远程协作缺乏方便和完整的解决方案。  Currently, for web users, one of the most significant pain point is the lack of easy and complete solution for remote collaboration. 有许多场景，在这些场景中用户需要与远程用户分享当前在他们屏幕上的东西，例如一个绘画、一个视频、在线故障检测期间他们的设备当前的状态以及指定的一些内容。 There are many scenarios, users need to share something on their current screen with remote users in these scenarios, such as a painting, a video, the current state of their equipment during an online fault detection as well as some of the content specified. 目前要做到这一点唯一的方法是要签署一个支持屏幕共享的桌面客户端，请求联络允许开始共享。 Currently to do this is the only way to sign a support screen sharing desktop client, contact requests permission to start sharing. 如果一方没有这样的客户端，或者他希望共享的屏幕那个人客户端上的联系人，该方法则无效的。 If one is not such a client, or that he wants to share screen contacts on individual client, this method is ineffective. 此外，这些解决方案不适用于手机和其他小屏幕设备。 In addition, these solutions do not apply to mobile phones and other small screen devices. •能够以个性化、一致的方式访问HTTP或HTTPS。  • HTTP or HTTPS to access personalized and consistent manner. 如图16所示，对于一个非限制性实施例，一个服务的用户将被分配一个http: //myscre · en/ joeblow形式的网址(URL)，无论该用户何时共享他的一个或多个他/她的屏幕时，都作为访问用户屏幕的固定访问链接。 16, for one non-limiting embodiment, a user is assigned a service http: // myscre · en / joeblow in the form of a URL (the URL), whether or not the user when one or more of his share his / her screen, both as a fixed access link to access the user's screen. 然后所述用户能和他/她的朋友、同事、在线的社交网络等共享这个URL。 The user can then and his / her friends, colleagues, and other online social networks to share this URL. 此处，所述URL可以是一个所谓的缩略网址(TinyURL)(域名通常小于10个字符)可以对网络上的位置作一个简单的速记。 Here, the URL may be called a thumbnail URL (TinyURL) (typically less than 10 characters domain) may be made of a simple shorthand location on a network. •访问某人的屏幕共享网址是可以通过默认选项自定义的，以实现只有当用户主动的选择共享他/她的屏幕时访问才能实现。  • Access screen sharing one's website is by default option to customize in order to achieve access to only when a user actively choose to share his / her screen to achieve. 此外，通过向用户提供参与者通行代码的合并、定时屏幕共享会话和IP地址过滤选项，以确保最大程度的控制用户共享他/她的屏幕的人群。 In addition, the merger participant pass code by providing the user with periodic screen sharing session and IP address filtering options to ensure maximum control user groups to share his / her screen. •当在屏幕共享模式下，可以向参与者显示可用屏幕的列表，参与者可以选择这些列表中的一个或多个进行观看。  • When the screen sharing mode, a list of available screens may be displayed to the participant, the participant can choose these lists one or more of viewing. 根据主机的权限设置，他们也可以发出远程访问与共享的屏幕进行交互。 According to a host of permissions, they can also send remote access and sharing screen to interact. 如Skype公司已经创建了浏览器插件，其通过在显示在他/她浏览器上的任意号码旁边显示一个“Skype电话”图标，允许一个参与者用单击的方式对显示在他/她浏览器上的任意号码进行呼叫，并通过一个Skype桌面客户端传送这些呼叫。  As Skype has created a browser plug-in, which is by displaying a "Skype phone" icon next to him / her on any number of browser that allows a participant with a click way to display his / any number on her browser to make a call, and transmits the call through a Skype desktop client. 另一方面，如今的用户的在线联系人可能是在多个存储方式中的一个，如谷歌联系人、交易所、雅虎联系人、Skype、 Facebook等。 On the other hand, today's online contacts a user may be stored in multiple ways, such as Google contacts, Exchange, Yahoo contacts, Skype, Facebook and so on. 尽管这些联系人在本机应用程序中能以不同的方式交互(对于非限制性实施例，例如悬停于谷歌联系人，会向用户出现一个具有与该联系人发邮件或即时通话选项的菜单），但是没有一个简单普遍的方式来提供跨越不同联系协议的，类似于Skype对号码所做的一键式视频呼叫功能。 Although these contacts can interact in a different way (for non-limiting embodiment, for example, hover Google contacts, a menu appears with the contact e-mail or instant calling options to the user in the native application ), but there is no simple way to provide universal across different association agreement, similar to one-button video call feature Skype for number did. 在一些实施例中，用户体验引擎106支持web浏览器和/或桌面插件，其使得能够智能一键式视频会议呼叫来自于视频会议终端的认证协议的VMR联系人中的参与者能够(而非号码）。  In some embodiments, the user experience engine 106 supports a web browser and / or a desktop widget that enables participants to a call from the contacts VMR video conference terminal authentication protocol smart key a video conference can be (instead of numbers). 如本文所述，插件指的是扩展一个较大程序的功能的一小片软件，所述插件常被用在web浏览器和桌面应用程序中，以在特定区域延伸它们的功能。 As described herein, it refers to a plug-in extension of a function of a larger program of a small piece of software, often used in the insert web browser and desktop applications, to extend their functionality in a particular area. 1.用户必须同意安装这些插件以及激活所述插件的应用程序。  1. The user must agree to install applications and plug-ins to activate the insert. 2.为了启用应用程序，来自认证协议(假设是消息协作和谷歌联系人)的每一个联系人旁边有一个“视频呼叫”图标。  2. In order to enable the application, next to each contact from authentication protocol (assuming that is the message of collaboration and Google contacts) has a "video call" icon. 对于一个非限制性例子，如果在一个用户的Exchange邮箱中的邮件的发送者是一个认证协议，则信箱的显示界面被增加一个视频通话的图标以及一个显示更多选项的小箭头。 For a non-limiting example, if the sender of a message in a user's Exchange mailbox is an authentication protocol, the mailbox display interface by adding a video call icon and a small arrow display more options. 3.单击该图标在用户和联系人之间通过VMR建立一个视频会议呼叫，其中双方选择适当的视频终端。  3. Click the icon in the contact between the user and the establishment of a video conference call by VMR, in which the parties select the appropriate video terminal. 4.单击所述箭头为用户提供用户可以通过VMR服务与联系人进行交互的方式的完整列表，所述VMR服务包括音频呼叫、安排一个将来的呼叫等。  4. Click the arrow to provide users with a complete list of the way the user can interact with the service by the VMR contacts, the VMR include audio call service, schedule a future call or the like. 在一些实施例中，当一些视频会议呼叫房间太亮并导致注意力分散时，用户体验引擎106自动执行视频增益控制。  In some embodiments, some of the video conference call when the room is too bright and cause distraction, the user experience engine 106 performs automatic video gain control. 类似于音频系统中的AGC (自动增益），视频会议终端的所有房间的亮度是视频会议的一部分，其可以被调整以产生一种会议发生在同一个地方的假象。 Similar to the audio system of the AGC (automatic gain), the luminance of the video conference room is part of a video conference terminal, which may be adjusted to produce an illusion of a meeting place in the same place. 可选的，视频自动增益控制可以由会议中感觉一个或多个房间的亮度令其不安的参与者打开。 Alternatively, the video AGC may feel by the conference or brightness in a room to make it more open uneasy participants. 在一些实施例中，用户体验引擎106提供关于进行中的视频会议费用节省的实时信息，例如每个会议的节省的英里、汽油成本、酒店成本。  In some embodiments, a user experience engine 106 provides real-time information on the cost of video conferencing ongoing savings, such as savings miles each conference, gasoline costs, hotel costs. 其中，参与者之间的距离可以根据IP地址的地理位置和英里数计算，并且联邦英里数积分可以根据每次通话节省的英里计算以在屏幕上呈现一个总金额。 Wherein the distance between the participants based on the number and geographical location of IP addresses miles computing, and federal integral number of miles can be calculated to present a total amount of miles on the screen according to each call savings. 所述声称的碳抵消也可以根据参与者的位置和呼叫的持续时间计算，并适当的显示给参与者。 The carbon offset can be claimed according to the duration and location of the call participants is calculated, and displayed to the appropriate participant. 虚拟实境(VR)表现了计算机化身与静态图像之间光谱跨度，其中所述计算机化身是预配置供选取的，所述静态图像是可上传的并且在有限程度上动态的（animated)。  Virtual Reality (VR) spectral performance computer span between a still image and an avatar, wherein the avatar is a computer configured for pre-selected, the image is static and dynamically uploaded to a limited extent (Animated ). 在一个多方视频通话设置中，没有办法要么将该参与者迀移到一个虚拟世界中，而同时保持他们现实世界的人物角色，要么将他们移植入一个虚拟实境(VR)世界中并且同时动画他们的人物角色。 In a multi-party video call settings, there is no way to either the participant Gan move a virtual world, while maintaining their characters real world, or will they transplanted into a world of virtual reality (VR) and at the same time animation their characters. 在一些实施例中，为了解决上述讨论的两个问题，用户体验引擎106通过全球基础设施引擎104的MCU向一个视频会议的参与者呈现逼真的虚拟实境(VR)事件。  In some embodiments, in order to solve two problems discussed above, a user experience engine 106 presents a realistic virtual reality (VR) event by MCU Global Infrastructure engine 104 to participants of a video conference. 像传统的视频会议呼叫一样，所述VMR接受来自不同参与者摄像机的音频/视频流的输入并把他们复合成一个整体，然后进行编码和分别传送所述复合视频给每一个参与者。 Like conventional video conference call as the VMR different participants accept input from a video camera audio / video stream and put them into a composite whole, are then encoded and transmitting said composite video to each participant. 如图18所示，当参与者希望一个事件的虚拟实境(VR)版本时，用户体验引擎106接受下列一个或更多额外的步骤向参与者传送VR体验。 As shown, when participants want to virtual reality (VR) version of an event, the user experience engine 106 to accept one or more of the following 18 additional step of transmitting VR experience to the participants. 1.图像检测和分割组件1802接受来自于每个参与者的输入的视频。  1. The detection and image segmentation component 1802 receiving inputs from each participant of the video. 2.分割组件1802从视频流的背景中检测和提取出参与者，并提供关于他/她在视频流中的位置和其它特征的元数据。  2. The cutting member 1802 is detected and extracted from the background of the participants in the video stream, and providing metadata on his / her position in the video stream and other features. 3.然后用户体验引擎106通过虚拟实境渲染组件1804在参与者面部上增加各种各样的特征或通过应用任意图像变换算法变换面部，使参与者变得生动。  3. The user experience engine 106 through the virtual reality render component 1804 increases on the participant's facial features or by applying various image transformation algorithms transform any portion, so that the participants become vivid. 用户体验引擎106可以进行进一步分析面部和特征检测以及充分使参与者的脸部生动化，进而创建一个脸部本身的半动画版本。 User experience engine 106 can be further analyzed and facial feature detection and full participants in the face of vivid, and then create a semi-animated version of the face itself. 4.在媒体处理节点300内的视频合成器通过用由虚拟实景的（生动化的）参与者覆盖的背景替换所选取的背景，并向其他参与者提供该视频流。  4. The video combiner 300 within the media processing node selected by the replacement with the background covered by the virtual reality (vivid) of the participants background, and provides the other participants of the video stream. 通过这种方法，用户体验引擎106能够获取和转换来自不同参与者，以不同的自定义方式输入的视频和音频流，以达到不同的用户体验。  In this way, the user experience and conversion engine 106 can obtain from the different actors in different ways to customize the input video and audio streams, in order to achieve a different user experience. 在一些实施例中，用户体验引擎106可以将所有参与者从他们的的视频流环境中提取出来，然后将他们添加到一个共同的环境中并且作为一个视频流发送。  In some embodiments, the user experience engine 106 may be extracted from all participants of the video stream of their environment, and then add them to a common environment and transmitted as a video stream. 对于一个非限制性实施例，位于不同的地理位置的不同参与者进行呼叫都可以看起来像是彼此坐在会议桌前的谈话。 For a non-limiting embodiment, different geographic location different call participants are talking to each other appear to sit at the table. 提供小范围的，实时提供的关于在特定地理范围内的用户可用的服务的广告具有广阔的市场应用前景和巨大的利益。  provide a small range of advertising on users in a specific geographic range of services available to provide real-time market has broad prospects and great benefits. 现存的少数的解决方案严重依赖或完全依赖GPS相关信息，或者移动设备上的高性能处理器来执行所要求的程序以产生该信息。 Existing solutions rely heavily on a small number or rely solely on GPS information, or a program to perform the required performance processor on the mobile device to generate the information. 在一些实施例中，用户体验引擎106允许通过全球基础设施引擎104的MCUs实现基于互联网/云计算的增强现实的用户交互服务。 In some embodiments, a user experience engine 106 allows for augmented reality user interaction services based on the Internet / global cloud computing infrastructure by MCUs engine 104. 更近一步地，用户体验引擎106对由参与者/用户视频会议终端(例如，一个带摄像头的手机)采集的视频流进行解析，并且提供增强现实的视频连同参与者所在地理区域可获得服务的注释一起反馈给用户，例如当地活动、娱乐和餐饮选择等。 One step closer to the user experience engine 106 pairs by the participant / user video conferencing terminal (for example, a mobile phone with a camera) capture video stream is parsed, and provides augmented reality video, along with the geographic area where the service is available participants Notes with feedback to the user, such as local events, entertainment and dining options and so on. 用户只需要将一个视频电话放在VMR，并且将他/她的视频摄像头对准他或她所感兴趣的地方。 Users only need a video phone in the VMR, and his / her video camera at his or her place of interest. 正如图19所示，用户体验引擎106和全球基础设施引擎104在云端处理接收到的视频，这样用户设备中不需要具有处理器能力，对于一个非限制性实施例，通过图像检测和分割组件1902分析广告牌、可以确认的路标以确认核实从位置服务数据库1904获取的GPS信息，或从用户GPS获取的信息，以确定他/她的行踪。 As shown in Figure 19, the user experience engine 106 and engine 104 global infrastructure processing the received video in the cloud so that the user equipment need not have processor capacity, for a non-limiting example, and by detecting an image segmentation component 1902 analysis of billboards, signs can confirm to confirm the verification of GPS location information obtained from the 1904 database services, or information obtained from the GPS user to determine his / her whereabouts. 用户体验引擎106然后用收集的用户地理信息更改输入视频源并通过元数据合成器1906覆盖该视频流，以向用户产生一个增强现实视频流，其中该元数据合成器具有的元数据包括，例如步行范围内餐馆的名字、当地娱乐场所的名字等。 User experience engine 106 and to change the input user geographic information collecting video sources and 1906 to cover the video stream by meta data synthesizer to generate a user augmented reality video stream, wherein the meta data synthesizer having metadata include, e.g. name restaurants within walking distance, such as the name of a local entertainment. 如图19所示，图像检测和分割组件1902是该逻辑的核心，其用来分析输入视频和从视频中提取感兴趣的区域。 As shown in  19, an image segmentation component 1902 is detected, and the core logic, which is used to analyze the region of interest extracted from the input video, and video. 位置服务数据库1904被填入关于不同压缩编码的信息，其可以将GPS信息和/或压缩编码作为输入，并提供关于在该区域的服务的丰富数据以及其它可能感兴趣的信息。 Location service database 1904 is populated with information about the different compression coding which may be GPS information and / or the compression coding as input and provides a rich data regarding the service of the region, and other information that may be of interest. 如前所述，元数据合成器1906从图像检测和分割组件1902,位置服务数据库1904获取输入信息，并实时呈递有用的元数据，所述并且用关于周围环境的有用的元数据覆盖输入视频源。 As described above, meta data synthesizer 19061904 acquires input information from the image detection and segmentation component 1902, the location service database, and real-time presentation of useful metadata, and covers the input video source with useful metadata about the surrounding environment . 在一些实施例中，当用户在所述区域周围行走时，用户体验引擎106可能提供一个该区域的指导旅行，所述用户体验引擎106可以预先在屏幕上填充关于该区域的风景和声音的更多信息。  In some embodiments, when the user is walking around the area, the user experience engine 106 may provide a travel guide in the region, the user experience engine 106 may be pre-filled landscape on the region on the screen and For more information about the sound. 在另外一些实施例中，用户体验引擎106也可以在视频中填充信息，以及显示可能在附近的朋友的照片，以将这种增强现实服务嵌入已存在的服务中，以定位位于同一区域的朋友。 In other embodiments, the user experience engine 106 may be filled with information, and may be displayed in the video at a friend's nearby photo to this augmented reality service embedded in existing services to locate friends at the same region . 在一些实施例中，由用户体验引擎106提供的增强现实服务是可定制的，不仅仅是在向用户的移动终端上安装下载的任何软件时，而且是在每次使用方式上。  In some embodiments, the augmented reality service provided by a user experience engine 106 is customizable, not just download any software installed on the user's mobile terminal, but also in the way each time. 用户使用增强现实服务可能是为了各种各样的目的，对一个非限制性实施例，在某一个时刻进行411查询，在那之后，用户可以立即打电话和得到一个突出显示的当地旅游的虚拟旅程，不久之后，用户可能还需要餐馆的相关信息去大餐一顿。 Users may use the augmented reality service for a variety of purposes, for a non-limiting embodiment, carried out 411 inquiries in a certain moment, after that, the user can call and get a highlighted local virtual tour immediately journey, shortly after, the user may also need information about a restaurant meal to meal. 随着能够在在第三方网站上得到关于每一个地方的更多信息，用户体验引擎106提供一种无缝的方式与因特网/云端上的每一个提供者密切关联，以向每个用户提供更多当前信息。 As can get more information about each place in on third-party websites, user experience engine 106 to provide a seamless way closely related to the Internet / on each cloud provider to provide to each user and more current information. 由于这种方法是完全堆架式，只取决于用户选择的方案，所述通话可以通过一个具备更强大运行能力的系统来运行以获取并为用户提供更多有用的信息，这样依据每个用户所需要的功能提供一套完整的定价选择。 Since this method is completely the rack and stack, only depending on the program selected by the user, the call may be provided by a more powerful operating system to run the ability to obtain and provide more useful information to the user, so that each user based on the functionality required to provide a complete set of pricing options. •不只应用音频/视频传输，还实时传输从发送者格式到接收者所选择接收数据的格式的文件/输入，其中这种转换是在云中实现。  • only by audio / video transmission, but also real-time transmission format from a sender to a file format of data received / input the selected recipient, wherein this conversion is achieved in the cloud. 考虑到构建的延迟，当两方或者多方当事人使用不同语言进行沟通时，可以通过采用人工翻译来替代这种功能。  consideration of the delay constructed, when two multi-party or parties to communicate using a different language, such a function may be replaced by artificial translation. 实时多媒体通讯系统，比如上文描述的系统，需要高效、低延迟的编码和解码机制来支持，尤其是对于H. 264视频流。  Real-time multimedia communications systems, such as the system described above, the need for efficient, low-latency support for encoding and decoding mechanisms, especially for H. 264 video stream. 当今，实时交互视频通讯正开始在消费者和商业领域广泛应用。 Today, real-time interactive video communications is beginning in the consumer and commercial areas widely used. 同时，这种通讯所使用的网络在过去的10年中也得到了大幅的改善，并且在性能和质量方面还在不断地改进。 At the same time, this communication network used for the past 10 years has also been greatly improved, and also continuous improvement in performance and quality. 高端商业远程呈现会议通过高质量、低损耗的专用网络来实现， 而家用视频聊天通常使用跨越全球中转站的公共因特网或使用带宽拥挤、竞争激烈、高损失的无线网络来实现。 High-end business telepresence meetings through high-quality, low-loss private network to achieve, and home video chat across the globe normally used public transit station or Internet bandwidth congestion, intense competition, the wireless network to achieve high losses. 这样的商业和消费者视频通讯正在越来越多的通过同一类型的网络融合在一起，并且不再那么容易将这样的视频通讯仅限制在高质量专用网络上。 Such business and consumer video communications are increasingly fused together by the same type of network, and is no longer so easy to video communications such restrictions only on high-quality private network. 在一个非限制的例子中，访问东京的商业旅行者需要参加纽约总部和伦敦分公司之间的一个远程呈现会议。 In a non-limiting example, access to Tokyo's business travelers need to participate in a distance between the headquarters in New York and London branches presented the meeting. 游行者没有从他的旅馆房间到纽约总部的高质量专用网络。 The marchers did not from his hotel room to the New York headquarters of high-quality private network. 纽约总部和分公司可能有专用连接，但是考虑到成本，该连接也可能切换为通过公共因特网运行。 New York headquarters and branch offices may have a dedicated connection, but considering the cost, the connection may be switched to run over the public Internet. 在这种情况下，由于所述网络的不断变化的状态，为这样的视频会议而使用的实时视频技术需要适应损失，以仍然提供商业级别的会议体验。 In this case, due to the constantly changing state of the network, real-time video technology such as video conferencing and the need to adapt to the loss of use, in order to still provide business-level meeting experience. 这是为实时多媒体通讯系统建立视频流的高效、低延迟编码/解码方案的动机所在。 This is to establish an efficient video streams for real-time multimedia communication systems, low-latency motivation encoding / decoding scheme lies. 提出的新方案可以是系统或方法，它们可以以一种高效的方式利用和整合复数抗误码H.264编码/解码方案，来支持低延迟多媒体通讯应用的H. 264兼容视频流的抗误码的编码。 The new scheme  The proposed system or method may be, they may be in an integrated and efficient manner using a plurality of error resilience H.264 encoding / decoding scheme, low-latency support H. 264 multimedia communications applications compatible video stream anti error coding. 即使在视频流的图像帧有网络损失时，这些抗误码H. 264编码/解码方案仍能用来提供较高质量的视频。 Even when the image frame of the video stream have a network loss, these error resilience H. 264 encoding / decoding scheme can still be used to provide higher quality video. 它有能力恢复这样的损失，并且较其他技术能够更快的恢复，而不需要为了获得同样级别的恢复通过所述网络发送的额外的数据/帧，这是个令人恼火的问题。 It has the ability to recover such a loss, and is able to recover faster than other techniques, in order to obtain the same level without the need to recover additional data / frame transmission over the network, this is annoying problem. 所述编码方案还具有能够与在所述视频流的接收端的未更改的解码器一起工作的特性。 The coding scheme also has a characteristic capable of working with unmodified decoder receiving end in the video stream. 在一些实施例中，视频代码转换器，比如图3中示出的媒体处理节点300的视频代码转换器304,能够用作编码和发送所述视频流的一个视频编码器，也能够用作接收和解码所述视频流的一个视频解码器。  In some embodiments, the video transcoder, such as media processing node in Figure 3 the video transcoder 300 shown in 304, can be used as a video encoder and transmits the encoded video stream, it is possible as a video decoder receiving and decoding the video stream. 所示视频编码器和所述视频解码器能够与在不同地理位置的不同媒体处理节点相关，它们被用来实现和整合所述抗误码H. 264视频编码方案，其包括但不限于在下文介绍的被描述为“分层P结构(hierarchical P structures)”和“参考帧选择（reference frame selection)''的技术。 As shown in the video encoder and the video decoder can be associated with different media processing node in different geographic locations, and they are used to implement the integration of 264 error resilience video coding scheme H., including but not limited to the following presentation is described as "P hierarchical structure (hierarchical P structures)" and "reference frame selection (reference frame selection) '' technique. 分层P结构是以分层结构组织的一组已编码的图像帧，如果所述分层结构的较高时间层(higher temporal layer)的图像帧丢失，在所述分层结构的较低时间层（lower temporal layer)的图像帧仍然能够由视频解码器解码。  P structure is a hierarchical set of image frames organized hierarchy coded image frames if the higher temporal layer hierarchy (higher temporal layer) is lost in the hierarchy lower temporal layer (lower temporal layer) of the still image frames can be decoded by the video decoder. 在Η. 264编码时，使用反向预测(backward prediction)将所述分层结构中的所有图像帧编码为P图像帧，比如在时间上较早产生的帧能够被用来预测在时间上较晚产生的帧。 In Η. 264 coding using backward prediction (backward prediction) encoding all image frames of the hierarchy is a P picture, such as frame generated earlier in time can be used to predict than in the time Night frames generated. 在图20A示出了一个例子中，所述图像帧被组织成从0至3的四个时间层(深度为4)，它们沿时间轴从左到右按时间依次排布。 In FIG. 20A shows one example, the image frame is organized into four temporal layers from 0 to 3 (a depth of 4), from left to right along the time axis are arranged in chronological order. 在一个非限制的例子中，如果2层的图像帧丢失了，具有箭头指向所述2层的图像帧的0层的图像帧仍然能够被解码，被所述2层的图像帧的箭头指向的3层的图像帧则不能被解码。 In a non-limiting example, the layer 2 frame if the image is lost, an image frame 0 arrow points to the layer 2 frame image layer can still be decoded by the layer 2 frame pointing arrow image layer 3 is an image frame can not be decoded. 在一些实施例中，为了在视频流的不同帧率时具有相同的结构长度，作为媒体处理节点的视频编码器的视频代码转换器304,可以基于视频流的帧率改变H.264视频流的分层P结构的深度(层数）。  In some embodiments, in order to have the same overall length at different frame rates of the video stream as the video transcoder is the video encoder media processing node 304, the frame rate may be changed based on the H.264 video stream the depth of the hierarchical structure of a video stream P (number of layers). 在图20A示出了一个例子中，对于30帧/秒的视频流，所述深度可以是4层或8帧(两个连续的0层的图像帧之间的距离），结构长度为8/30秒= 264ms。 In FIG 20A shows an example, for 30 frames / second video stream, the depth may be (the distance between two successive image frames 0 layer) 4 or 8, the structural length of 8 / 30 seconds = 264ms. 对于15帧/ 秒的视频流，所述深度可以是3层或4帧，具有相同的结构长度4/15秒=264ms。 For 15 frames / second video stream, the depth may be three or four, have the same structural length of 4/15 seconds = 264ms. 在一些实施例中，作为视频解码器的视频代码转换器304可以通过反向通道机制(比如，在网络工程任务组（Internet Engineering Task Force)的RFC4585中描述的实时传输控制协议(基于RTCP的反馈(TRP/AVPF))的扩展RTP简介，其在这里作为参考)触发参考帧选择方案，基于一帧的部分或全帧丢失给所述视频编码器提供了负反馈。  In some embodiments, a video transcoder is the video decoder 304 via a reverse channel mechanism (for example, real-time transport control protocol (described in the RFC4585-based network Engineering Task Force (Internet Engineering Task Force) in extended RTP Profile for RTCP feedback (TRP / AVPF)), which is herein incorporated by reference) triggers the reference frame selection scheme, based on a partial or full loss of one frame to the video encoder provides a negative feedback. 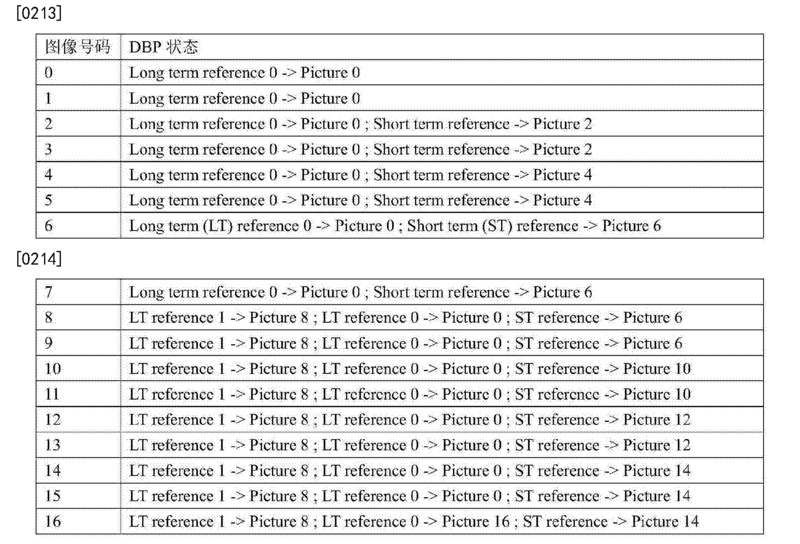 参考帧选择的实现通常需要大的DPB缓存以保持多个候选参考帧。 Reference frame selection achieved generally require larger DPB buffer to hold a plurality of candidate reference frames. 参考帧选择方案背后的想法是保证在编码侧的DPB中包含足够多的图像(参考帧）以覆盖在所述视频编码器和所示视频解码器之间的往返通讯延迟，以至于合适的参考帧仍然在DPB中，并在发生帧丢失时能够被提供给所述视频解码器。 The idea behind the reference frame selection scheme is guaranteed to contain a sufficient number of images (frames) in the DPB encoding side to cover the round trip communication between the video encoder and the video decoder shown delay that suitable reference frame remains in the DPB, and when the frame loss occurs can be provided to the video decoder. 当通过负反馈给所述视频编码器提供有关丢失了一帧图像的视频解码信号时，所述视频编码器会在所述DPB中挑选在时间上较所述丢失帧更早被编码的一个参考帧， 并将其发送给所述视频解码器。 When the negative feedback to the video encoder provides information about missing an image of the video signal decoding, the video encoder will choose the DPB in the loss of more temporally earlier frame is coded with reference to a frame, and sends it to the video decoder. 随后，所述视频解码器使用来自所述视频编码器的所述参考帧预测下一图像帧。 Subsequently, the video decoder using the reference frame from the video encoder prediction next image frame. 虽然提供较在H.264中发送瞬时解码刷新（instantaneous decoding refresh，简称IDR)帧（其中所述IDR被用来同步或重启所述视频流的解码)更好的预测，由于需要非常大的DPB以在帧丢失的情况下保持必要的参考帧，在长往返通讯延迟面前，参考帧选择可能不会总是提供理想编码视频流。  Although providing a better prediction than sending an instantaneous decoding refresh (instantaneous decoding refresh, abbreviated IDR) frame (which is used to synchronize the IDR or restarting the video stream decoding) in H.264, since the need for very large DPB to maintain the necessary frame of reference in the case of frame loss, round-trip communication delay before long, the reference frame selection may not always provide the ideal encoded video stream. 因此希望对使用长期参考帧来最小化DPB的大小的参考帧选择方案进行一些改动。 It is therefore desirable to minimize the use of the long-term reference frame of the reference frame changes some options DPB size. 在一些实施例中，作为视频编码器的视频代码转换器304采用结合上文描述的分层P结构和参考帧选择两者的优点的视频编码方案。  In some embodiments, a video transcoder is the video encoder 304 using a combination of the above described hierarchical structure, and reference frame selection P advantages of both video coding scheme. 具体来说，所述结合的编码方案利用时间P结构来最小化帧丢失的影响，并即使在所述分层结构中的O层的图像帧丢失的情况下， 给所述视频解码器提供参考帧以继续所述视频解码器的解码。 In particular, the combined use of time coding scheme to minimize the effects of the structure P frame loss, a case where the image frame and O even when the layer hierarchy lost, to the video decoder reference continuing the decoded video frames to the decoder. 此外，所述结合的编码方案可以利用H.264的特点以最小化所述视频编码器所占用的资源。 Furthermore, the coding scheme can be combined to minimize the resource occupied by the video encoder using the characteristics of H.264. 在一些实施例中，视频代码转换器304通过类似上文描述的使用长期参考帧和重新排序操作(reorder operations)的技术建立时间结构以实现所述结合的方案。  In some embodiments, the video transcoder 304 similar to that described above by using the long-term reference frames and reorder (reorder operations) techniques to establish the time to achieve the combined structure of the program. 所述差别是使用了多个长期参考帧(在一个非限制的例子中，一个额外的长期参考帧对应250ms的往返通讯延迟）。 The difference is the use of a plurality of reference frames long (in a non-limiting example, a reference frame corresponding to the extra long round trip communication delay of 250ms). 在一个非限制的例子中，每增加250ms的往返通讯延迟，需要在所述显示图像缓存中增加存储一个长期参考帧。 In a non-limiting example, 250ms each additional round trip communication delay, it is necessary to increase the display image buffer storing a long-term reference frame. 250ms的往返通讯延迟需要深度为3的DPB，500ms的往返通讯延迟需要深度为4的DPB。 250ms round-trip communication delay required depth of DPB 3, and 500ms round-trip communications latency required depth of the DPB 4. 在一些实施例中，所述视频编码器可以以循环方式(round robin fashion)记录用作〇时间层的所述长期参考帧。  In some embodiments, the video encoder may be used as the recording layer billion times in a cyclical manner (round robin fashion) long-term reference frame. 所述视频编码器可以跟踪哪个长期参考帧当前被用来建立所述分层结构。 The video encoder may track which the current long-term reference frame is used to establish the hierarchical structure. 如果所述视频解码器信号显示丢失了〇层的图像帧，所述视频编码器决定使用哪个长期参考帧来解码所述下一图像帧。 If the video decoder signal display an image frame is lost square layer, the video encoder determines which long-term reference frame to decode the next image frame. 从所述DPB中选择哪个长期参考帧的决定基于负反馈确定，此时所述视频编码器可以选择在所述指示的丢失帧紧前的长期参考帧。 Selecting reference frames from which the long-term in the DPB is determined based on negative feedback is determined, then the video encoder may choose a long before the lost frame in the reference frame indicated by said tight. 所述决定也可以根据估计的往返通讯延迟而被直接推断出来。 The decision also may be inferred directly from the estimated round trip communications latency. 在这种情况下，所述丢失图像帧或所述图像帧的丢失部分的详细信息/负反馈是不需要的，只需要所述视频流的图像帧的丢失的指不。 In this case, the loss of image details lost frame or frame portion of the image / negative feedback is not required, only the lost image frames of a video stream refers not. 图20C和下面的图表示出了，所述视频流中的第一个16帧图像序列是如何被所述视频代码转换器304 (用作视频编码器)使用新的结合编码方案编码的。  FIGS. 20C and shows the following figures, a first sequence of images 16 is how the video stream by the video transcoder 304 (as the video encoder) in conjunction with a new encoding scheme of. 需要知道的是，对于所述额外的长期参考帧使用循环方式。 We need to know that for the additional long-term reference frame using a cyclic manner. 使用的长期参考帧的号码能够被适当的增加。 Number of long-term reference frame used can be appropriately increased. 除了支持上文描述的交叉平台实时多媒体通讯系统，结合了分层P结构和参考帧选择两者优势的H. 264视频编码方案，还能够被用来支持视频流、视频广播、视频监控和更多其他类型的需要在媒介上编码视频并具有信息损失的应用。  In addition to the above-described cross-platform support for real-time multimedia communication system that combines a hierarchical structure and P reference frame selection of both worlds H. 264 video coding scheme, it can also be used to support video streaming, video broadcasting, video monitoring and more need other types of encoded video in the media and information loss applications. —个实施例可以根据本发明所揭示内容的指导，通过使用一般的或专用的数字电脑或微处理器实现，这对于计算机领域的技术人员来说是显而易见的。  - embodiments of the present invention may be under the guidance of the disclosure, by using a general or dedicated digital computer or microprocessor, will be apparent to those skilled in the computer art. 在本申请所公开内容的教导下，熟练的程序员能够很容易地编写出相适应的软件编码，这对于软件领域的所属技术人员来说也是显而易见的。 The teachings of the disclosure herein, a skilled programmer can easily write software code adapted, which for the person skilled in the software art is also obvious. 并且本发明通过使用集成电路或者通过适当的常规元件电路相互连接组成适当的网络对于所属技术领域的技术人员而言也是显而易见的。 And the invention to those skilled in the art is also evident through the use of an integrated circuit or connected to each other by suitable conventional circuits suitable network element. —个实施例包括一个计算机程序产品，所述计算机程序产品是一个机器可读的媒介，其上储存有指令，其可以指令一个或多个主机执行本文中所提出的任何功能。  - exemplary embodiments include a computer program product, the computer program product is a machine-readable medium having instructions stored thereon, which may be one or more host instructions to perform any of the functions set forth herein. 机器可读的存储介质可以包括但不限于，一种或多种类型的磁盘包括软盘、光盘、DVD，CD-ROMs， DRAMs，VRAMs，快速闪存器，磁卡或光卡，纳米系统(包括分子存储器Ics)，或者其它任何类型的适合存储指令和/或数据的媒体和设备。 The machine-readable storage medium may include, but are not limited to, one or more type of disk including floppy disks, optical disks, DVD, CD-ROMs, DRAMs, VRAMs, flash flash memory, magnetic or optical cards, nanosystems (including molecular memory suitable for storing instructions and / or data media and devices Ics), or any other type. 存储在任何计算机可读取介质上，本发明包括软件，这种软件是用于控制通用/专门的计算机或者微处理器的硬件，以及能够让计算机或微处理器与用户交互或者执行本发明的其他机制，这样的软件可以包括但不限于，设备驱动程序，操作系统，运行环境平台/容器，和应用程序。 Stored on any computer readable medium, the present invention includes software, such software for controlling the hardware is the general purpose / specialized computer or microprocessor, and can make a computer or microprocessor to interact with a user or execute the present invention, other mechanisms, such software may include, but are not limited to, device drivers, operating systems, execution environment platform / vessel, and applications. 上面要求保护主题的各种实施例的描述已经提供了说明和描述的目的。 Description of various embodiments of the  above the claimed subject matter has been provided for purposes of illustration and description. 它的目的并不是为了穷举或限制所要求保护的主题所公开的准确形式。 Its purpose is not intended to be exhaustive or to limit the exact form of the claimed subject matter disclosed. 许多修改和变化对于所属技术领域的技术人员而言都是显而易见。 Many modifications and variations to those skilled in the art are obvious. 系统的实施例和方法中所描述的界面(interface)， 这些内容很明显可以使用等价的软件概念来替换，比如类、方法、类型、模型、组件、构件(bean)，模块，对象模型，程序，线程和其它合适的内容。 Interface system according to embodiments and methods described in (interface), it is clear that these elements may be replaced by an equivalent software concepts such as classes, methods, type, model, component, member (the bean), module, object model, program, threads, and other appropriate content. 上述系统的实施例和方法中所描述的组件，很明显这些概念的可以使用等价的概念进行替换，例如类、方法、类型、界面、模块、 对象模型和其它合适的内容。 Example methods and components described in the above system, it is clear that these concepts may be used to replace the equivalent concepts, such as classes, methods, type of interface, module, object model and other suitable content. 被选择和描述的实施例是用来最佳的描述本发明的原理和实际应用，这样使得相关领域的技术人员能够理解本发明所要求保护的主题，因此各种具体的实施例和为了特定用途可预期的各种修改都是合适的。 The embodiments were chosen and described preferred embodiments are used to describe the principles and practical applications of the present invention, so that the skilled in the relevant art to understand the invention the claimed subject matter, and therefore various specific embodiments for specific uses and It can be expected that various modifications are appropriate. 1. 一个抗误码视频编解码系统，包括： 一个视频编码器，在其运行时，其将视频流的复数图像帧编码并组织为分层P-结构中的复数时间层； 在与所述视频编码器相关的显示图像缓存中记录所述视频流的一个或多个已编码的参考帧，其中每个参考帧已经被所述视频编码器编码，并能被视频解码器在一个或多个帧丢失时用作所述视频流的继续解码的重新开始点； 通过网络发送所述视频流的图像帧； 在所述视频解码器基于所述一个或多个丢失帧提供负反馈时在所述显示图像缓存中挑选一个在时间上较所述一个或多个丢失帧更早被编码的参考帧； 将挑选的参考帧发送至所述视频解码器； 所述视频解码器，在其运行时，其接收通过网络发送来的所述视频流，其中所述视频流具有所述一个或多个丢失帧； 基于所述一个或多个丢失帧通过反向通道机制给所述 1. An error resilient video coding system, comprising: a video encoder, while it is running, a plurality of image frames which encoded video stream organized into complex time and P- layer hierarchical structure; in the video encoder associated display image buffer recording a video stream of the one or more reference encoded frames, wherein each of the reference frames have been encoded by the video encoder and the video decoder can be in one or more of used as the starting point again continues to decode video stream frame loss; send the image frames of the video stream over a network; providing negative feedback in the video decoder based on the one or more missing frames in the selection of a display image buffer than the one or more missing frames are encoded temporally earlier reference frame; the selected reference frame to the video decoder; the video decoder, while it is running, receiving the video stream transmitted through a network, wherein the video stream having one or more of the lost frame; based on the one or more missing frames to the reverse channel mechanism 频编码器提供所述负反馈以触发所述参考帧的选择； 在所述视频流的解码过程中使用1)解码在所述分层P-结构中较所述一个或多个丢失帧的时间层更低的时间层的图像帧和2)使用挑选的参考帧作为所述视频流的继续解码的重新开始点的结合恢复所述视频流的图像帧中的一个或多个丢失帧， 所述视频编码器是媒体处理节点的一个部分，所述媒体处理节点用来接收来自多个视频会议终端的多个视频流，对于所述视频会议中的每一个参与者，将所述多个视频流实时转换并混合入与该参与者关联的视频会议终端相兼容的复合视频流，其中所述多个视频会议终端属于不同的类型，所述视频解码器位于所述多个视频会议终端中的一个中。 Audio encoder providing negative feedback to trigger the selection of the reference frame; 1 used in the process of decoding the video stream) decoding said one or more time than the lost frame in the hierarchical structure P- a plurality of image frames or a lower temporal layer and layer 2) using the selected reference frame to restore the video stream as the start point of the re-binding continues to decode the video stream lost frames, the the video encoder is a part of the media processing node, said media processing node to receive a plurality of video streams from a plurality of video conferencing terminals, for each participant of the video conference, the plurality video streams real-time conversion and mixed into the video conference terminal associated with the participant compatible composite video stream, wherein said plurality of video conferencing terminals are of different types, the video decoder at one of said plurality of video conference terminals in. 2. 根据权利要求1中所述的抗误码视频编解码系统，其特征在于： 所述视频编码器和所述视频解码器与在不同地理位置的不同媒体处理节点相关。 Error resilient video coding system according to claim 1 in the claims, wherein: the video encoder and the video decoder associated with the different media processing node in different geographic locations. 3. 根据权利要求1中所述的抗误码视频编解码系统，其特征在于： 当所述视频解码器与一个或多个编码方案一起工作时，所述视频解码器并未被更改。 1 according to the error resilient video coding system as claimed in claim, wherein: when the video decoder work with one or more coding schemes, the video decoder is not changed. 4. 根据权利要求1中所述的抗误码视频编解码系统，其特征在于： 所述视频编码器根据H. 264编码使用反向预测将所述视频流的图像帧编码成为P图像帧。 1 according to the error resilient video coding system as claimed in claim, wherein: the video encoder using the backward prediction encoded image frame of the video stream becomes the P picture encoded according to H. 264. 5. 根据权利要求1中所述的抗误码视频编解码系统，其特征在于： 所述视频编码器将所述视频流的图像帧组织为所述分层P-结构的复数时间层，使得所述视频解码器仍能够解码在所述分层P-结构中较所述视频流的一个或多个丢失帧的时间层更低的时间层的图像帧。 1 according to the error resilient video coding system as claimed in claim, wherein: the video encoder to the video image stream is organized in frames of a plurality of time P- the layered structure of the layer, such that the video decoder is still able to decode a frame image in the hierarchical level than the video stream structure P- or lower layer of a plurality of time frames lost time layer. 6. 根据权利要求5所述的抗误码视频编解码系统，其特征在于： 所述视频编码器根据所述视频流的帧率改变所述分层P-结构的层数以在不同帧率时保持同样的长度。 5 according to the error resilient video coding system as claimed in claim, wherein: the video encoder to change the number of layers of the layered structure according P- frame rate of the video stream at different frame rates to while maintaining the same length. 7. 根据权利要求5所述的抗误码视频编解码系统，其特征在于： 所述视频解码器预测并解码给定时间层的相同或更低的时间层的已编码的图像帧。 5 according to the error resilient video coding system as claimed in claim, wherein: said video decoder decodes the prediction and the same or lower temporal layer of the coded temporal layer given image frame. 8. 根据权利要求1所述的抗误码视频编解码系统，其特征在于： 所述显示图像缓存包含足够的图像帧以覆盖在所述视频解码器和所述视频编码器之间的往返通讯延迟。 The error resilience of the video codec system of claim 1, characterized in that: the display image buffer contains sufficient image frames to cover round-trip communication between the video decoder and the video encoder delay. 9. 根据权利要求1所述的抗误码视频编解码系统，其特征在于： 所述视频解码器使用来自所述视频编码器的参考帧预测下一图像帧。 9. The error resilient video coding system according to claim 1, wherein: said video decoder using a reference frame from the video encoder prediction next image frame. 10. 根据权利要求1所述的抗误码视频编解码系统，其特征在于： 所述视频编码器在所述显示图像缓存中记录了多个已编码的参考帧。 10. The error resilient video coding system according to claim 1, wherein: the video encoder in the display image buffer recording a plurality of reference coded frame. 11. 根据权利要求1所述的抗误码视频编解码系统，其特征在于： 即使在所述分层结构中的〇时间层的图像帧丢失时，所述视频编码器提供所述参考帧给所述视频解码器以使得所述视频解码器继续解码。 11. The error resilience according to a video codec system as claimed in claim, wherein: the video frame even square temporal layer hierarchy in the loss of the video encoder to provide the reference frame the video decoder so that the decoder continues to decode the video. 12. 根据权利要求1所述的抗误码视频编解码系统，其特征在于： 所述视频编码器选择所述视频解码器指示的丢失帧紧前的参考帧。 12. The error resilient video coding system according to claim 1, wherein: said video encoder selects the reference frame before lost frame indicated by the video decoder tight. 13. 根据权利要求1所述的抗误码视频编解码系统，其特征在于： 所述视频编码器基于所述视频流的图像帧的丢失帧的指示选择所述参考帧，而没有所述丢失帧的详细信息。 13. The error resilience of a video codec of the system according to claim, wherein: the video encoder lost frame indicating the selected image frames of the video stream based on the reference frame, without the loss of For more information frame. 14. 一种抗误码视频编解码方法，其包括： 视频编码器将视频流的复数图像帧编码并组织为分层P-结构中的复数时间层； 视频编码器在显示图像缓存中记录所述视频流的一个或多个已编码的参考帧，其中每个参考帧已经被所述视频编码器编码，并能被视频解码器在一个或多个帧丢失时用作所述视频流的继续解码的重新开始点； 视频编码器通过网络发送所述视频流的图像帧； 接收通过网络发送来的所述视频流，其中所述视频流具有所述一个多个丢失帧； 视频解码器基于一个或多个丢失帧提供负反馈以触发所述参考帧的选择； 在收到基于所述一个或多个丢失帧提供的负反馈时视频编码器挑选一个在时间上较所述一个或多个丢失帧更早被编码的参考帧;和视频解码器在所述视频流的解码过程中使用1)解码在所述分层P-结构中较所述一个或多个丢失帧的时 14. A method of anti-video codec error, comprising: a video encoder to a plurality of image frames of the encoded video stream and the hierarchical organization of complex time P- layer structure; recording the video encoder in the display image buffer one or more of said video stream has been encoded reference frames, wherein each continuing reference frame has been encoded the video encoder and the video decoder can be used when one or more lost frames of the video stream decoding restart point; video encoder transmits the image frames of a video stream over the network; receiving the video stream transmitted through a network, wherein the video stream having a plurality of said lost frame; a video decoder based on a or more lost frames to provide negative feedback to trigger selection of the reference frame; upon receipt based on the one or more lost frames to provide negative feedback of a video encoder selected in time than said one or more missing frame is encoded earlier reference frame; and a video decoder used in the decoding process of the video stream) decoding said one or more missing frames in the plurality of the layered structure P- 层更低的时间层的图像帧和2)使用挑选的参考帧作为所述视频流的继续解码的重新开始点的结合恢复所述视频流的图像帧中的一个或多个丢失帧， 其中所述视频解码器位于多个视频会议终端中的一个中，所述多个视频会议终端属于不同的类型。 Binding one image frame start point of an image frame again lower temporal layer and layer 2) using selected reference frames as the video stream continues to decode the video stream to recover one or more lost frames, wherein the video decoder of said plurality of video conference terminals located in one of the plurality of video conferencing terminals are of different types. 15. 根据权利要求14所述的抗误码视频编解码方法，其特征在于:其还包括： 根据Η.264编码使用反向预测将所述视频流的图像帧编码成为P图像帧。 Error resilience video codec 15. The method according to claim 14, characterized in that: further comprising: using the backward predictive coding according Η.264 image frame of the encoded video stream becomes a P picture. 16. 根据权利要求14中所述的抗误码视频编解码方法，其特征在于:其还包括： 将所述视频流的图像帧组织为分层结构的复数时间层，使得所述视频解码器仍能够解码在所述分层结构中较所述视频流的一个或多个丢失帧的时间层更低的时间层的图像帧。 16. The error resilience in the video encoding and decoding method according to claim 14, characterized in that: further comprising: a tissue image frame of the video stream for a plurality of temporal layer hierarchy, such that the video decoder still able to decode one or more video streams representing image frames in said hierarchy lower temporal layer lost frame temporal layer. 17. 根据权利要求16所述的抗误码视频编解码方法，其特征在于:其还包括： 根据所述视频流的帧率改变所述分层结构的层数以在不同帧率时保持同样的长度。 17. The error resilience video coding method according to claim 16, characterized in that: further comprising: changing the number of layers of the layered structure according to the frame rate of the video stream to maintain the same at different frame rates length. 18. 根据权利要求16所述的抗误码视频编解码方法，其特征在于:其还包括： 预测并解码给定时间层的相同或更低的时间层的已编码的图像帧。 18. The error resilience video coding method according to claim 16, characterized in that: further comprising: a prediction and a decoded image frame given the same or lower temporal layer times layer encoded. 19. 根据权利要求14中所述的抗误码视频编解码方法，其特征在于:其还包括： 在显示图像缓存中记录足够的图像帧以覆盖在所述视频解码器和所述视频编码器之间的往返通讯延迟。 Error resilience video codec 19. The method as claimed in claim 14, characterized in that: further comprising: displaying an image recording buffer sufficient to cover the image frames in the video decoder and the video encoder round-trip delay between communications. 20. 根据权利要求14所述的抗误码视频编解码方法，其特征在于:其还包括： 使用收到的参考图像帧预测下一图像帧。 Error resilience video codec 20. The method according to claim 14, characterized in that: further comprising: using the reference image predictive frame received next image frame. 21. 根据权利要求14所述的抗误码视频编解码方法，其特征在于:其还包括： 在显示图像缓存中记录了多个已编码的参考帧。 Error resilience video codec 21. The method according to claim 14, characterized in that: further comprising: recording a plurality of reference coded frame image in the display buffer. 22. 根据权利要求14述的抗误码视频编解码方法，其特征在于： 即使在所述分层结构中的〇时间层的图像帧丢失时，提供所述参考帧给所述视频解码器以使得所述视频解码器继续解码。 22. The 14-described error resilience video coding method as claimed in claim, wherein: the video frame even square temporal layer hierarchy in the loss of the reference frame provided to the video decoder such that the video decoder continues to decode. 23. 根据权利要求14所述的抗误码视频编解码方法，其特征在于： 选择所述视频解码器指示的丢失帧紧前的参考帧。 Error resilience video codec 23. The method according to claim 14, wherein: selecting the reference frame before lost frame indicated by the video decoder tight.